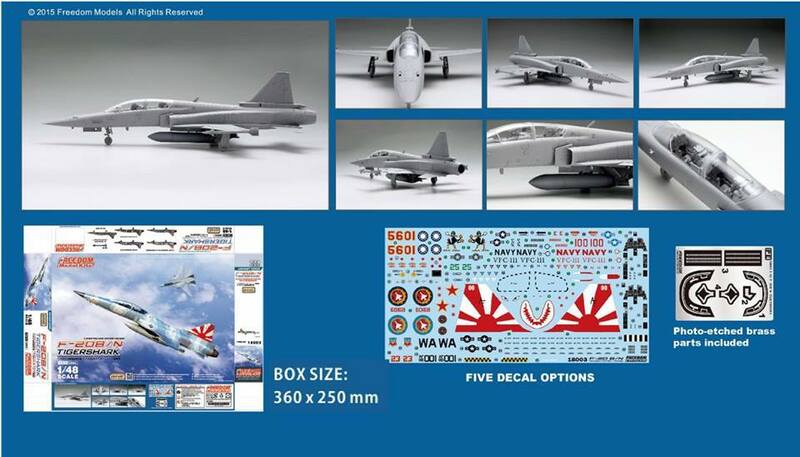 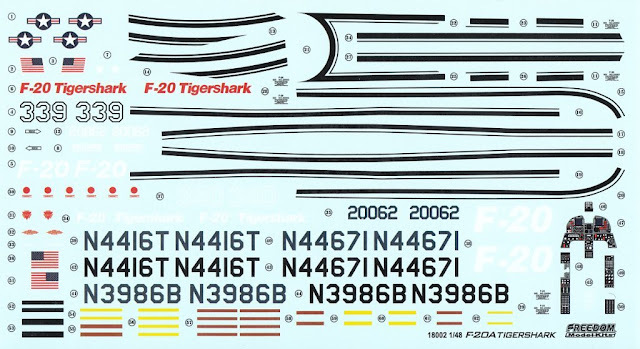 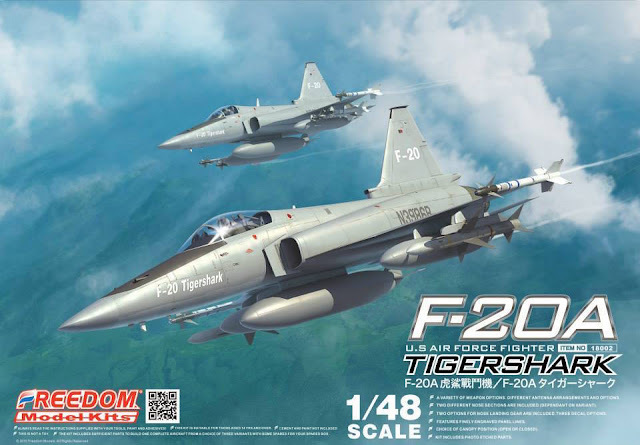 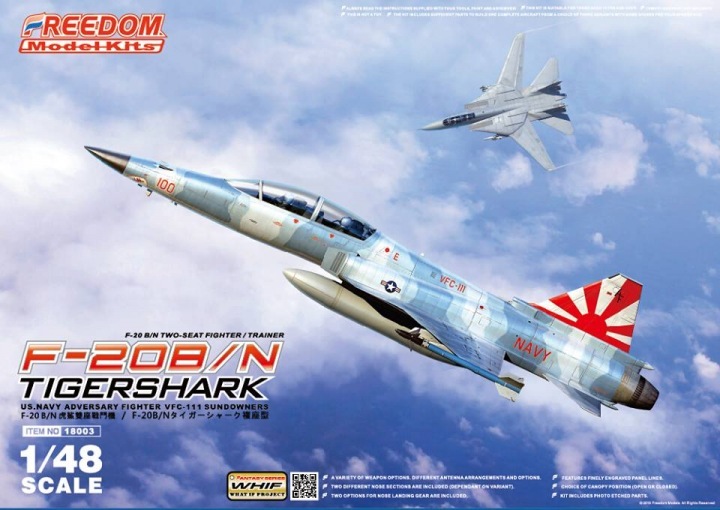 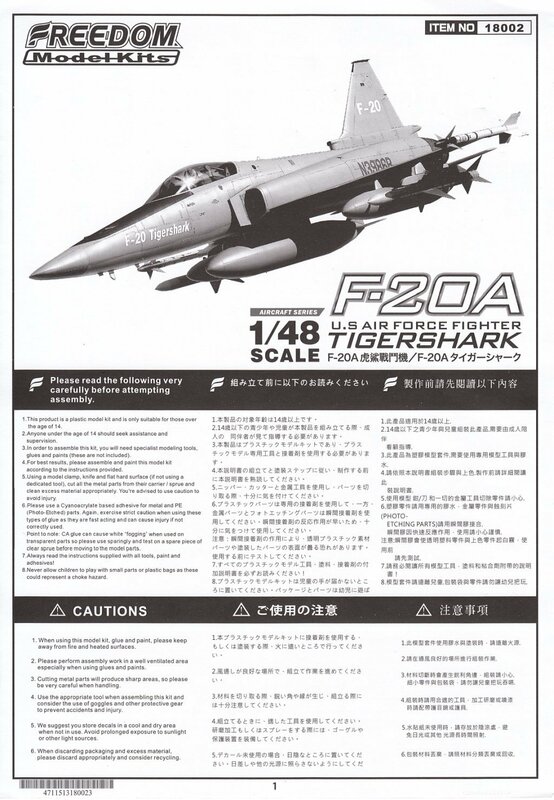 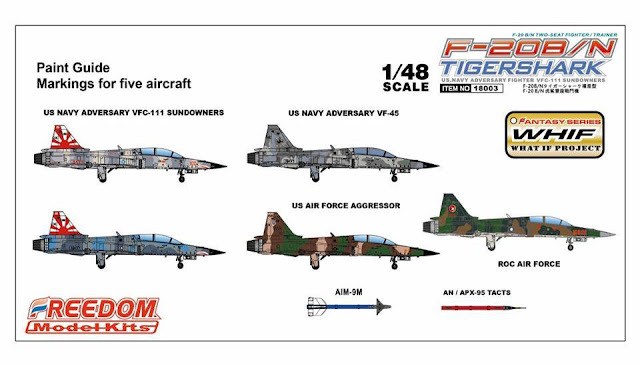 Freedom Models has just released its second aircraft kit in 1/48, the ill-fated Northrop F-20 Tigershark. Freedoms first kit was the futuristic looking X-47B UCAS in 1/48. 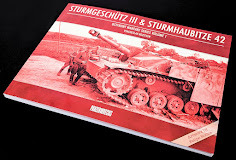 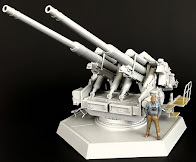 I found this a fascinating subject and eagerly built that model (see here) and had an enjoyable time doing it. 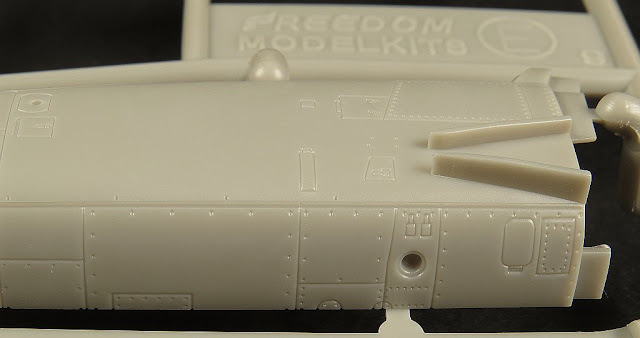 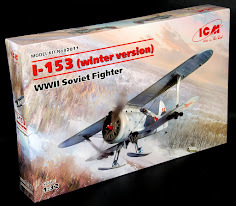 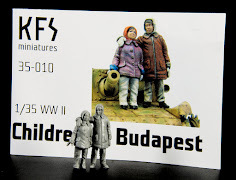 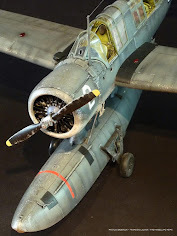 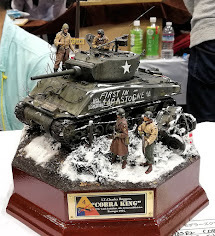 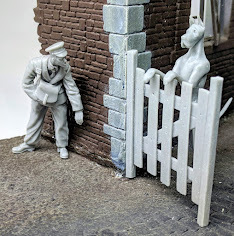 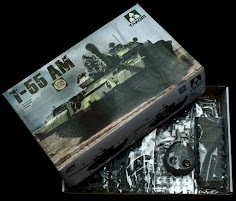 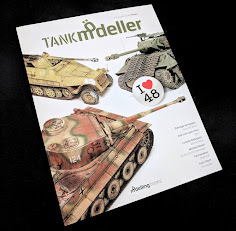 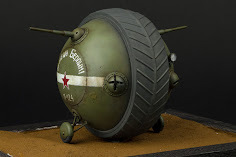 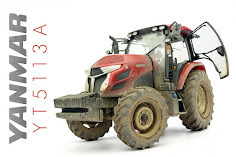 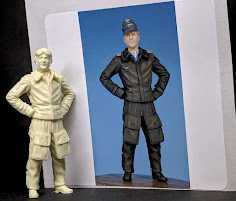 I was therefore quite keen to see what Freedom Model Kits (FMK) had planned for us next and this time around they have chosen to stay on the “path less travelled” and give us another subject a little out of left field. Well done I say, we need more manufacturers to be a little bold and not just keep pumping out more F-16s and Bf-109s. 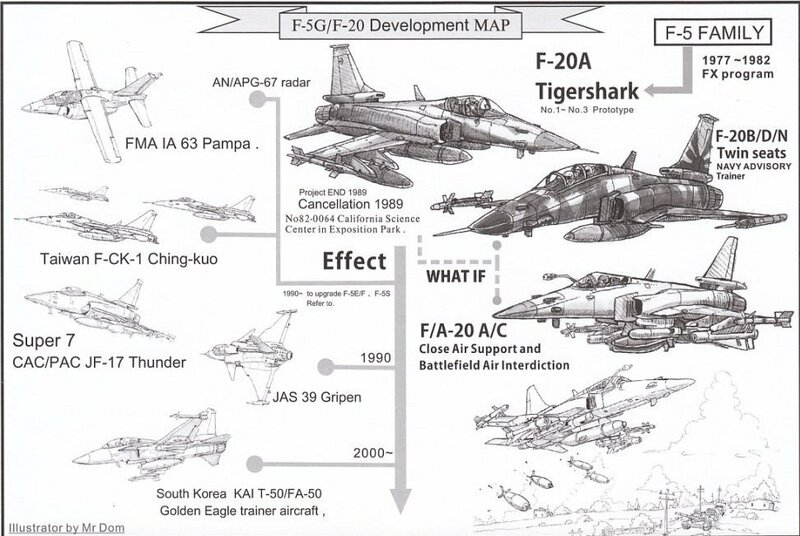 Much of the F-20's development was carried out under a US Department of Defence (DoD) project called "FX". 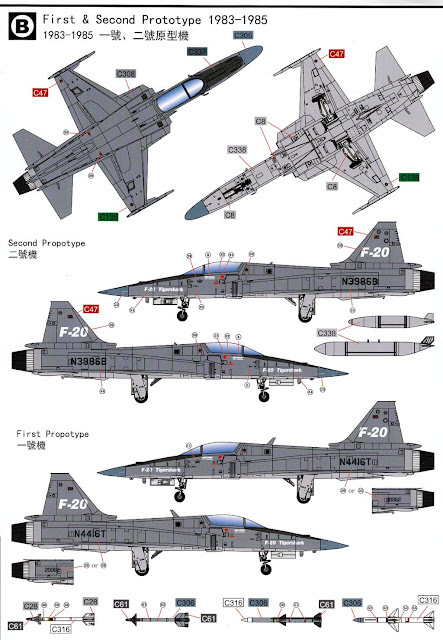 FX sought to develop fighters that would be capable in combat with the latest Soviet aircraft, but excluding sensitive front-line technologies used by the United States Air Force's own aircraft. 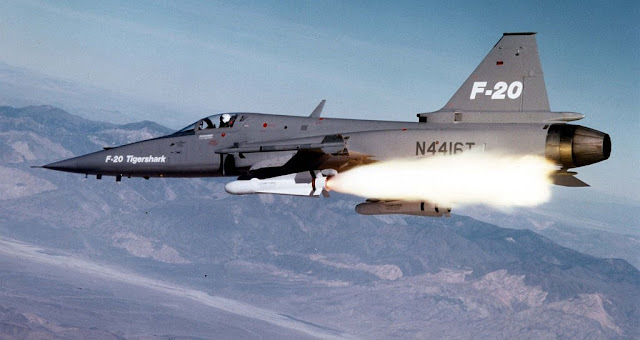 Northrop had high hopes for the F-20 in the international market, but policy changes following Ronald Reagan's election meant the F-20 had to compete for sales against aircraft like the F-16, the USAF's latest fighter design. The development program was abandoned in 1986 after three prototypes had been built and a fourth partially completed. 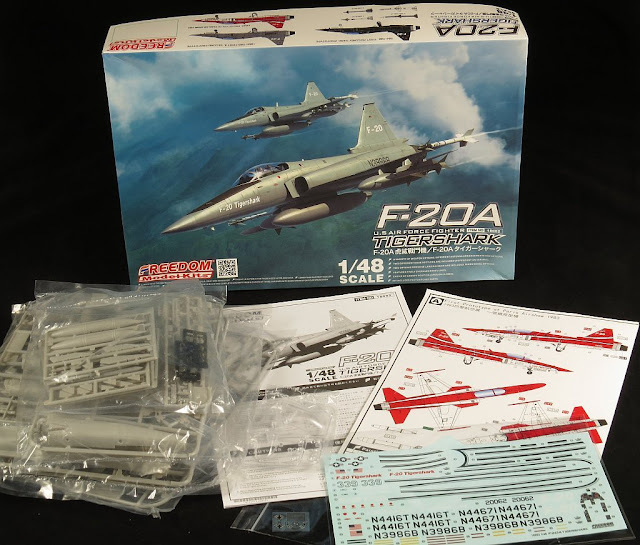 The Freedom Model Kit F-20A is packaged in a fairly standard configuration which each of the 4 main and 8 smaller weapons sprue sealed in their own protective plastic bags. 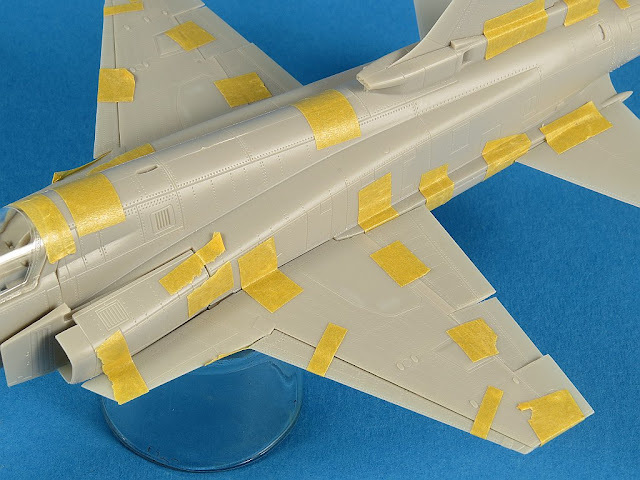 A small photo etch fret is provided along with a 10 page monochrome instruction booklet and separate glossy 3 page colour painting and markings foldout. 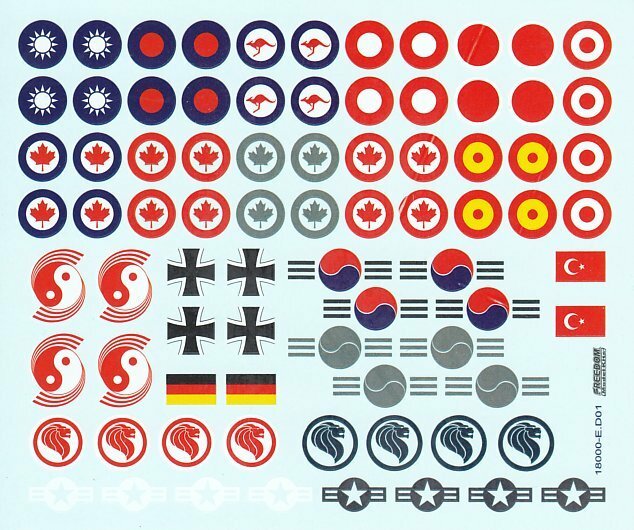 Two decal sheets are provided with the larger sheet containing markings for each of the 3 prototypes and the smaller sheet contains a myriad of assorted national insignias/roundels to get modellers started with their own “what-if” version of the F-20. 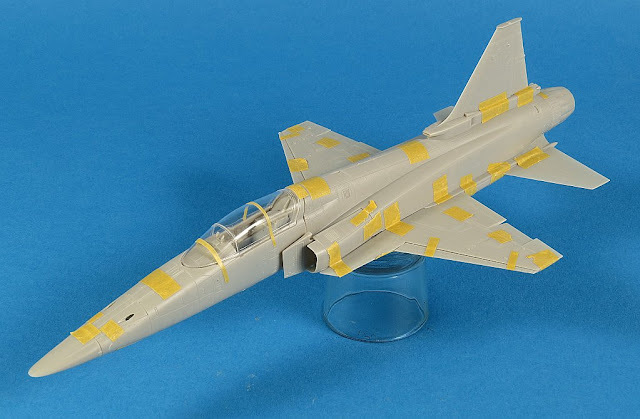 Despite Freedom providing the markings for the first prototype it’s not really possible to build an accurate model of this specific aircraft (with what’s provided in the box) because the first prototype had the cockpit (seat) and canopy of an F-5E. 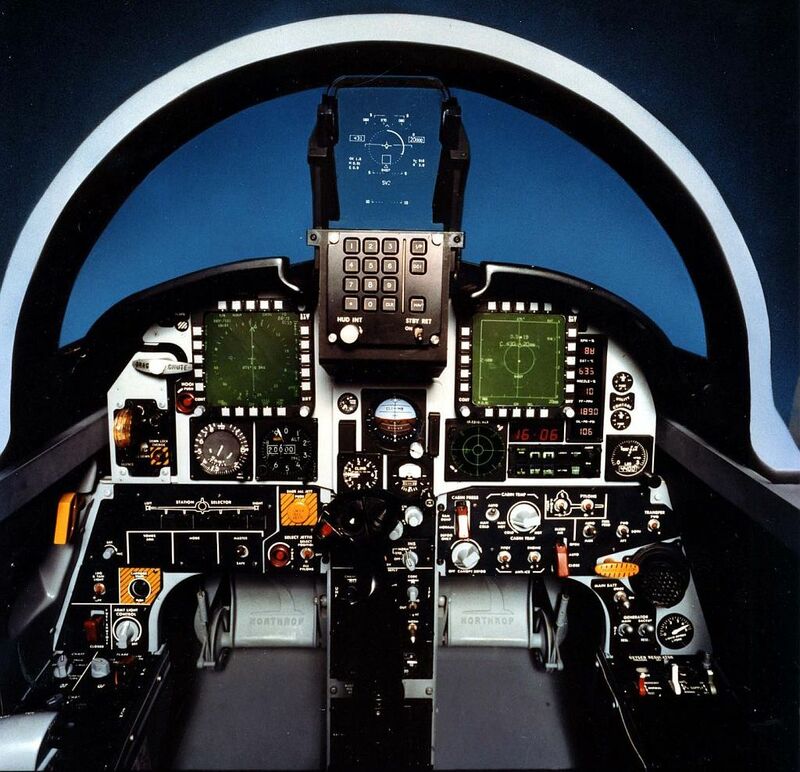 The later prototypes were fitted with a new, larger canopy and updated cockpit and ejection seat. 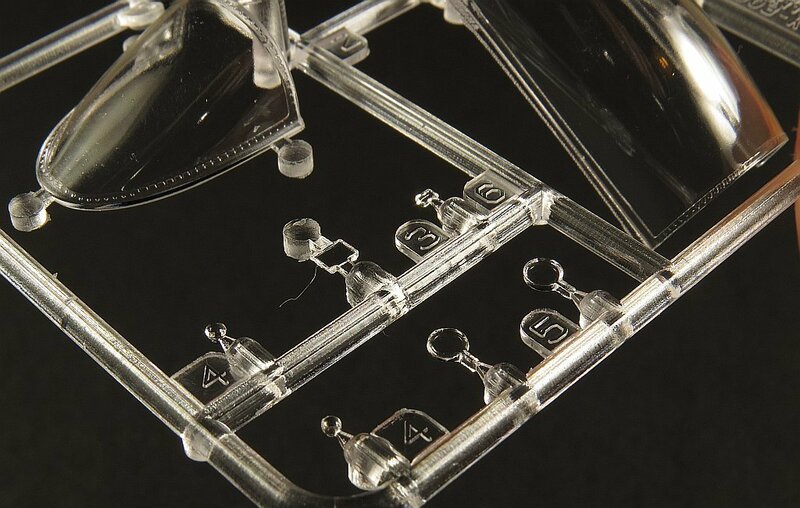 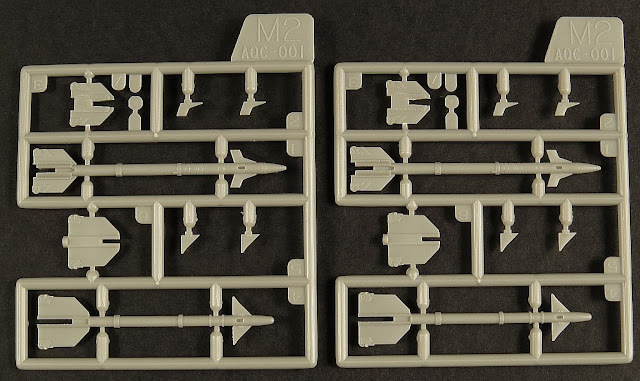 It is only these later parts that are included in the FMK box. 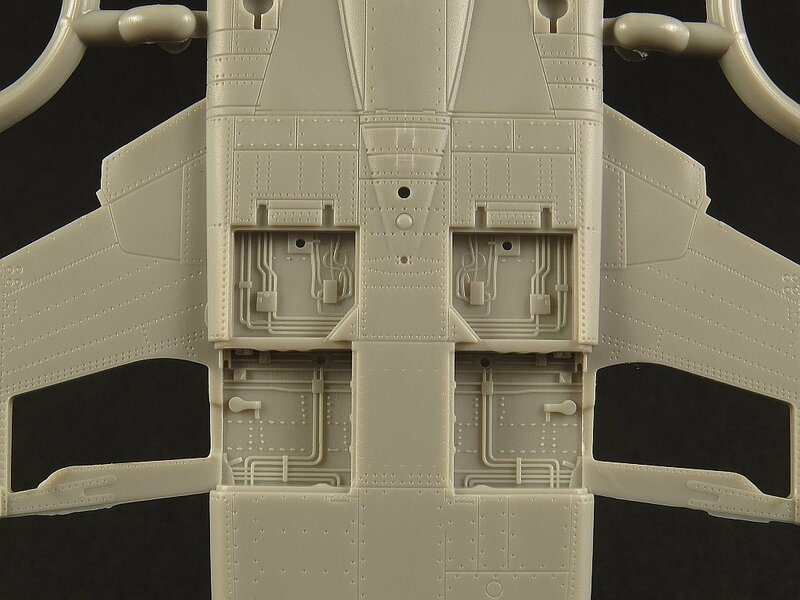 To their credit, FMK do provide both the longer (fitted to first aircraft) and shorter (second/third aircraft) noses in the box. This photo clearly shows the visible difference between the first (closest to camera) and later prototypes canopy (note the framing and amount of glass). So before we get to the blow by blow look at the sprues, I’m always most interested with any new kit just how well it actually fits together. 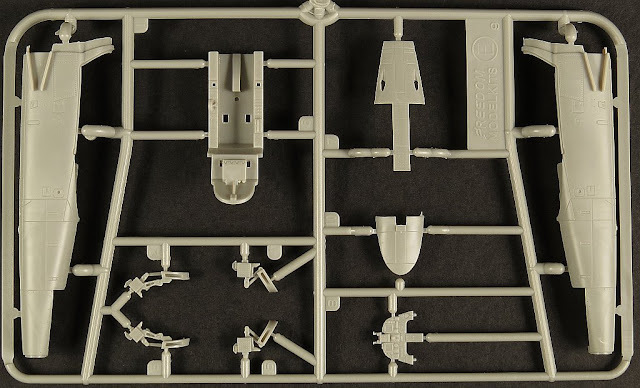 You can say what you like about what’s in the box but it’s not really till you get the parts off the sprues and start fitting them together that you actually get a feel for a kit. 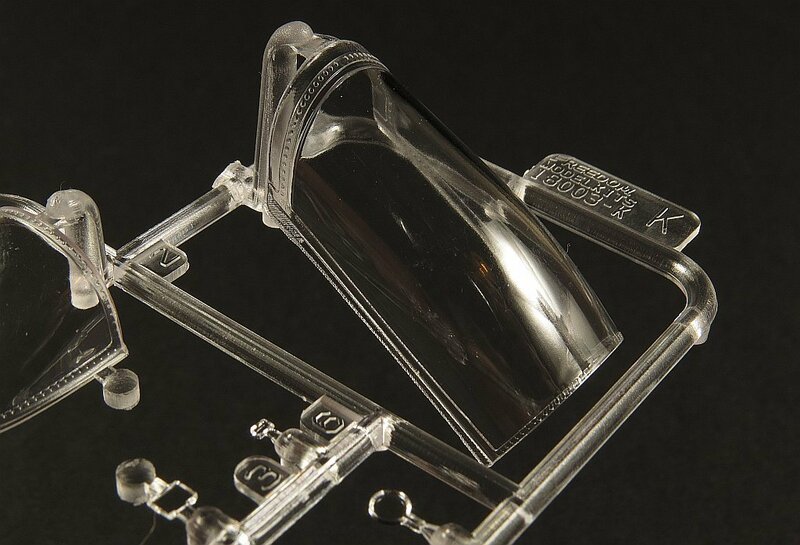 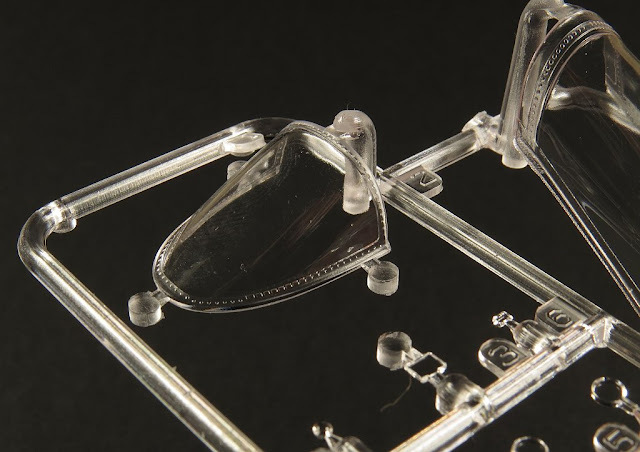 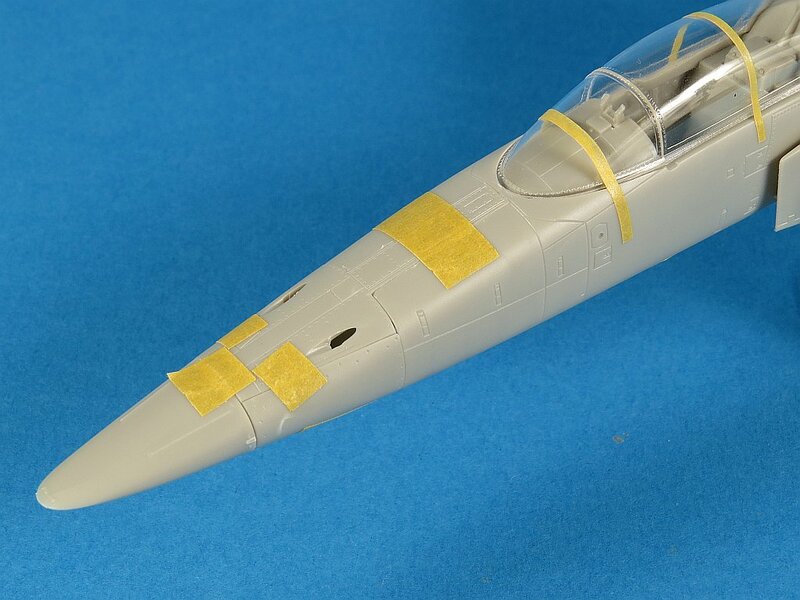 The clear parts fit very snuggly, so if you plan to build the model with the canopy closed you won’t have to worry about gaps or misalignment. 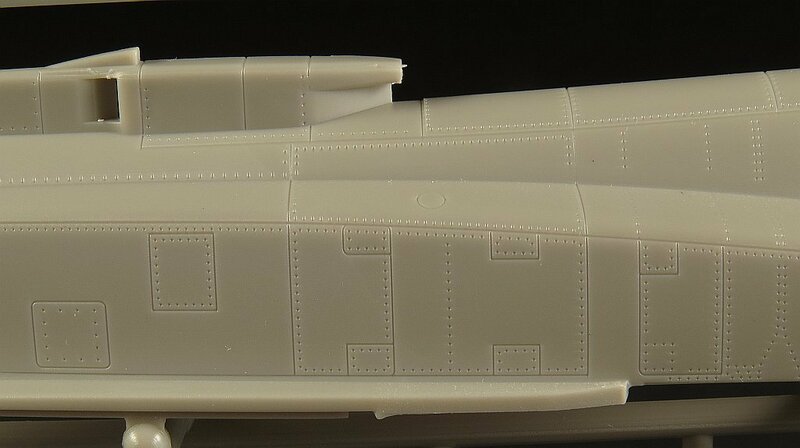 The surface detail (rivet and panel lines) is nicely done and should look just about right under few coats of paint. 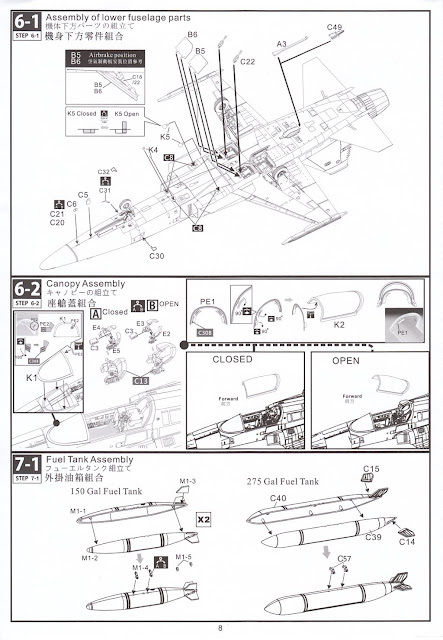 Of course the main reason for dry assembly is to check the fit and the general engineering (the way the parts are designed to come together). 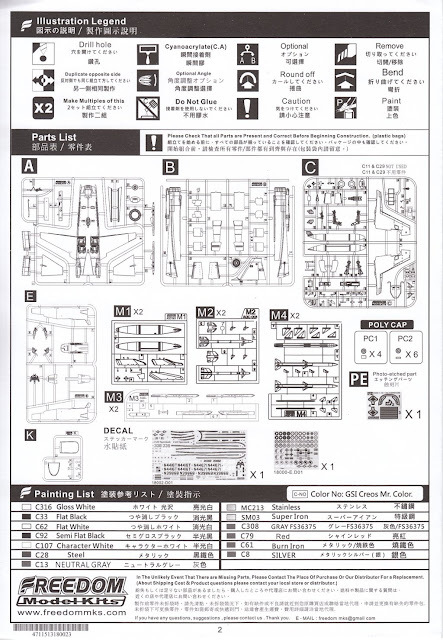 For the most part the fit of the parts I assembled was very good. 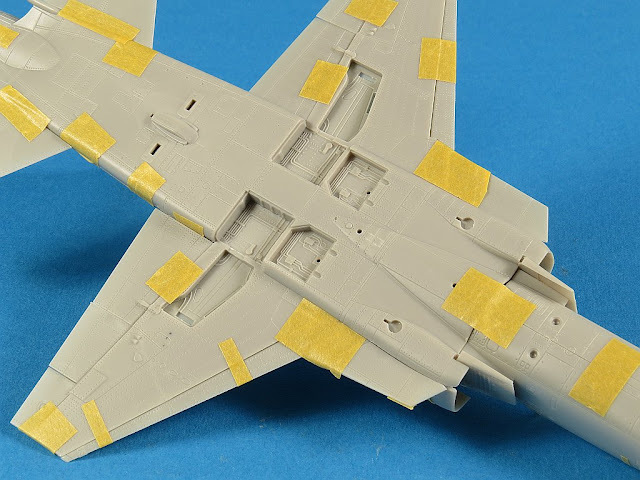 The intakes are a bit fiddly and will need some pre-planning to paint and assemble in the optimal sequence and I’m not convinced that the mounting pins for the horizontal tails are sturdy enough for the task. 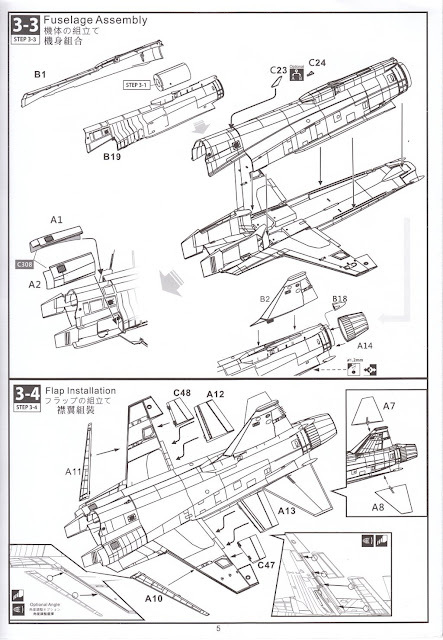 The F-20 had an all moving tail hinged at the central point. 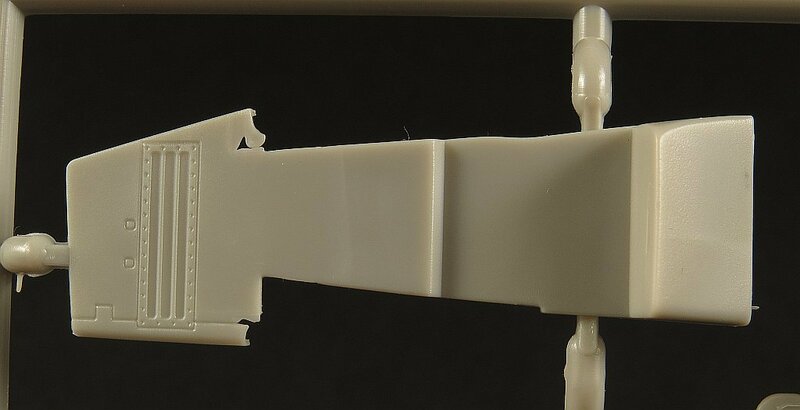 The FMK kit provides quite a short stub for the hinge which fits into a hole in the fuselage. 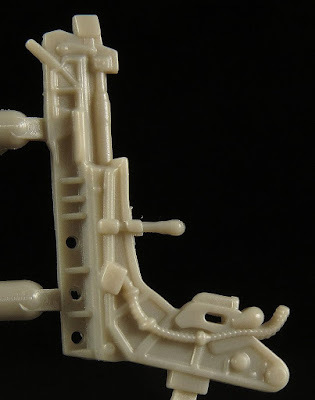 I’d be inclined to replace this stub with a longer section of plastic (or brass) rod for more strength and rigidity. 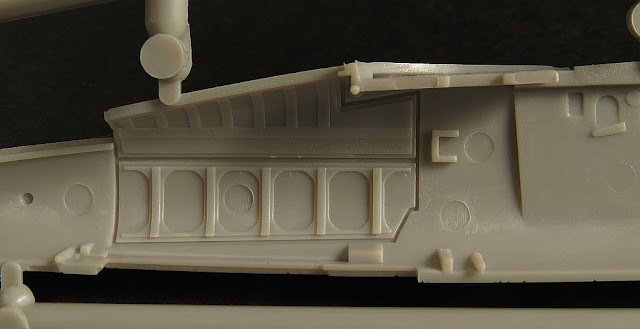 The main wheel well and airbrake interiors look to be adequately detailed and with careful paining will look great. 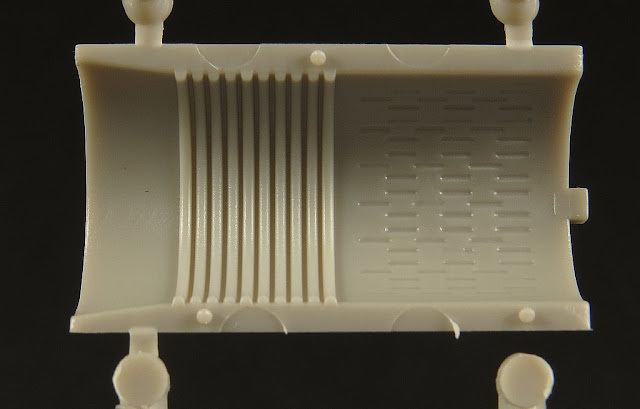 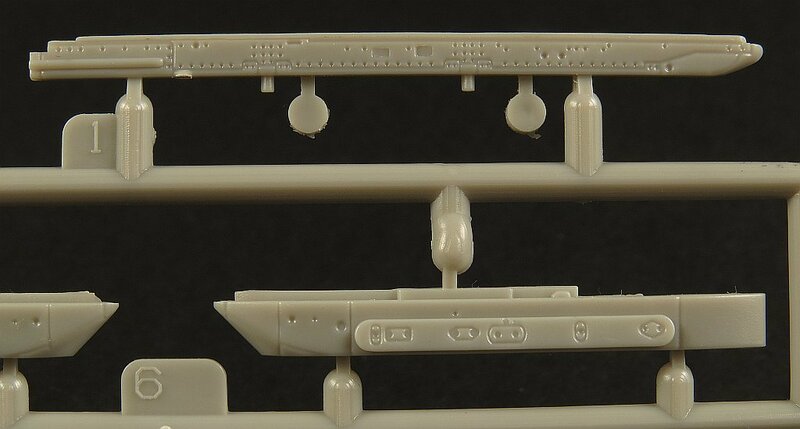 This sprue contains the main lower fuselage section. 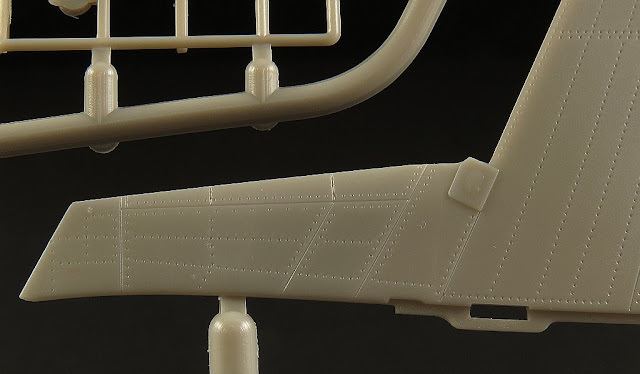 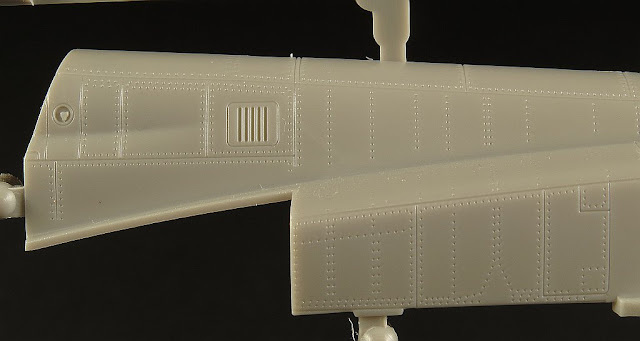 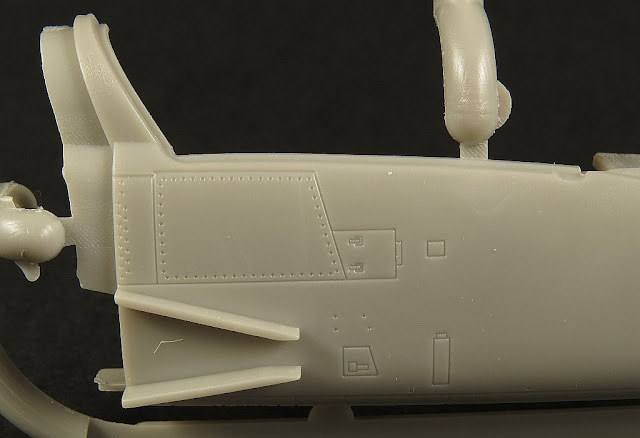 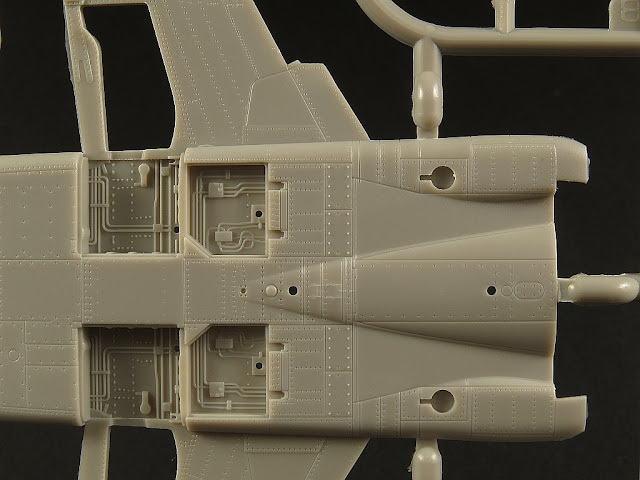 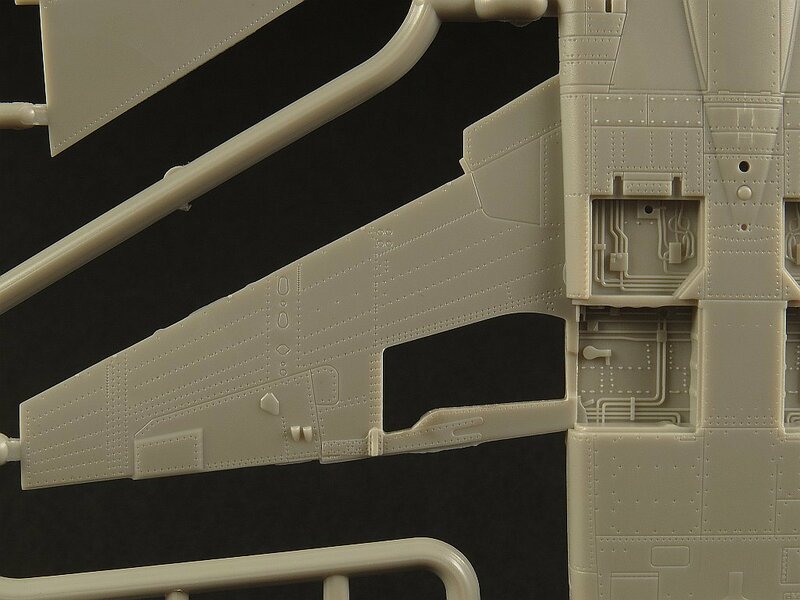 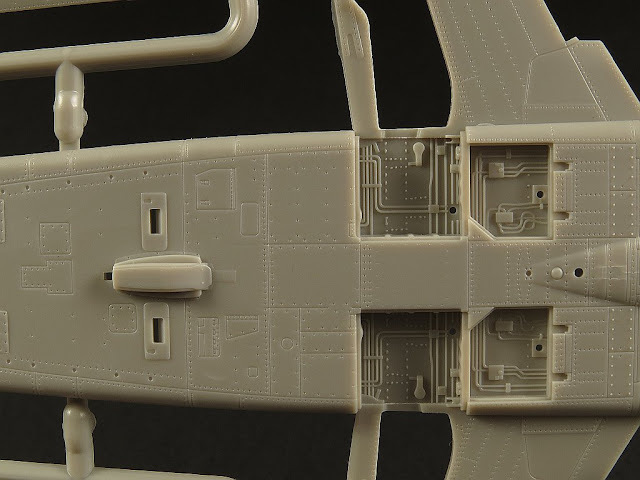 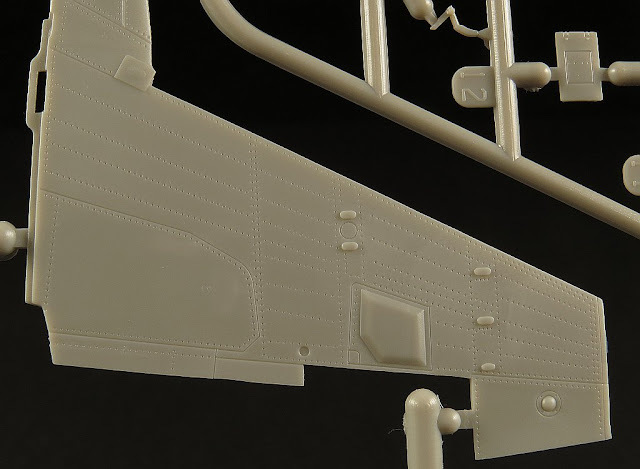 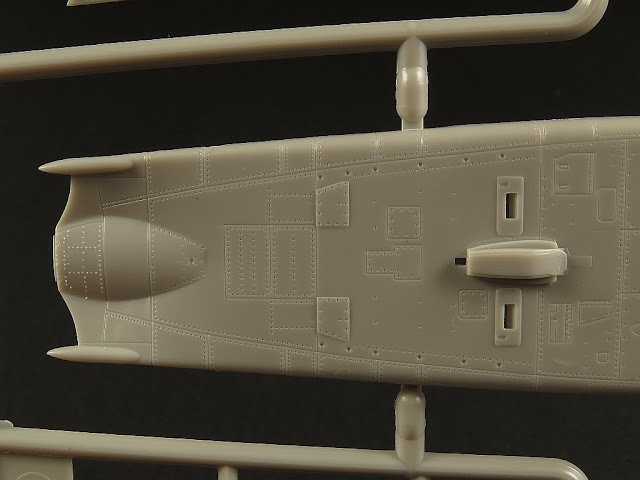 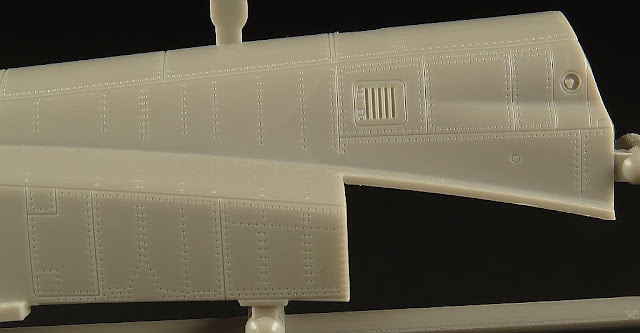 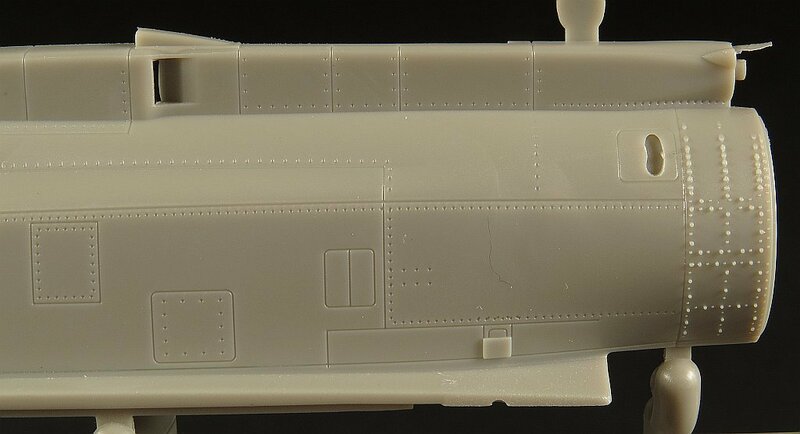 FMK has chosen to mould the wings integral to the fuselage (much like the much older Revell F-5 kits from memory). 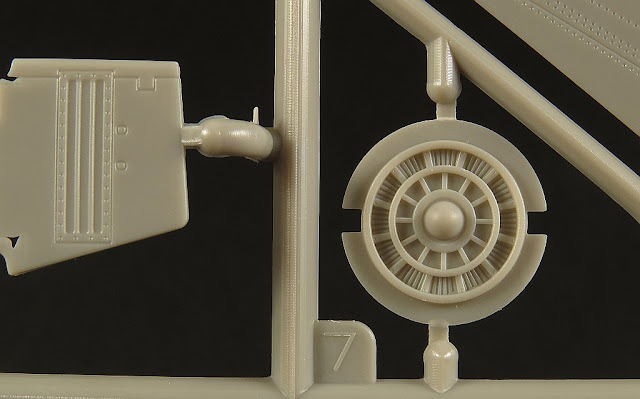 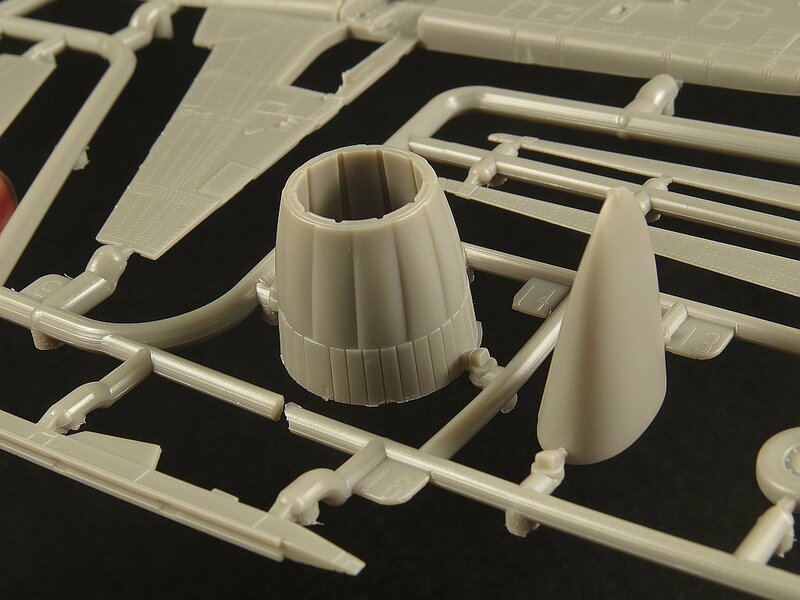 The horizontal tails, engine nozzle, nose wheel and strut, tail hook along with several pylons are also included on Sprue A. 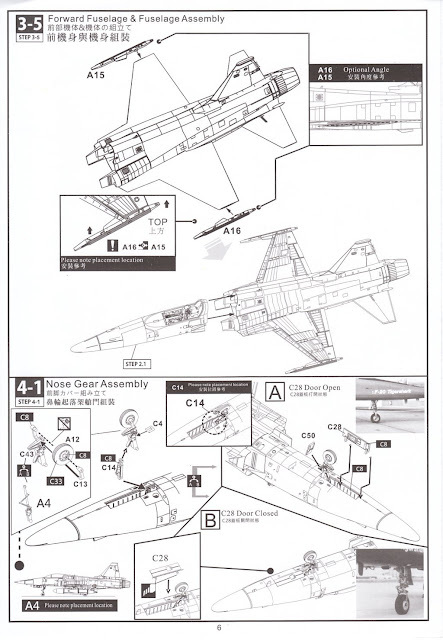 The primary design change between the earlier F-5E and the F-20 was the use of a single General Electric F404 engine that was originally designed for the F/A-18 Hornet. The new engine provided 60% more thrust compared to the combined output of the F-5E's paired General Electric J85s. 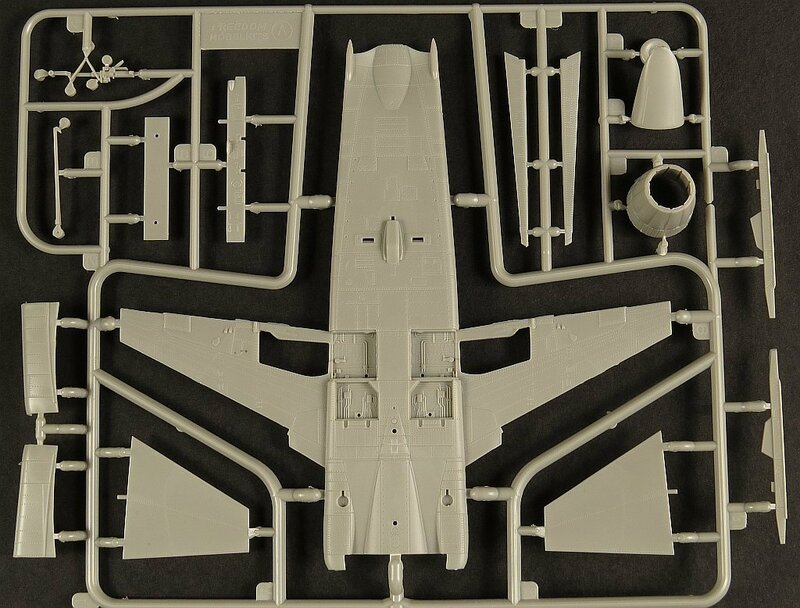 This sprue contains the main fuselage halves, vertical tail, flaps, main gear doors (open or closed option), airbrakes, intakes splitter plates and intake interior and finally the engine exhaust trunking. 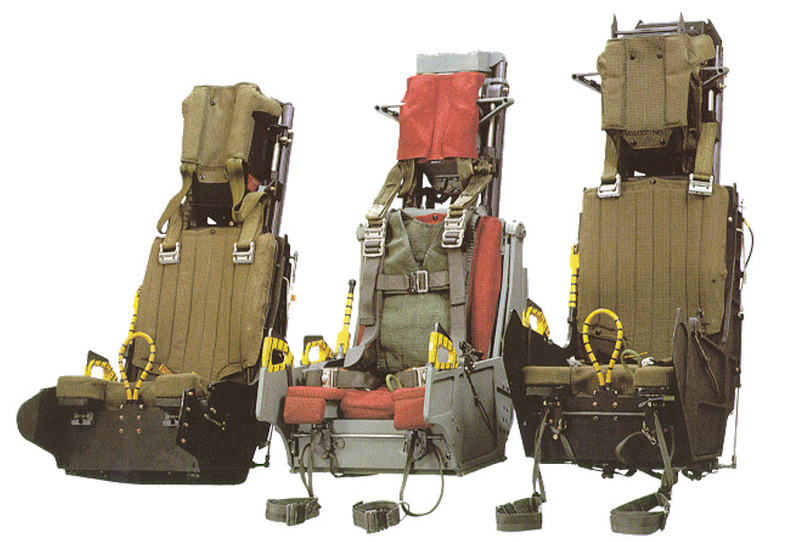 The F-20 was to be fitted with a UpCo Stencel S-III-S ejection seat. This particular seat is best known for its use in the USMC AV-8 Harrier aircraft but versions of the seat have been used in such aircraft as the Alpha Jet, F-16 FSED prototypes, the A-7 Corsair, the Argentine 1A-63, the YF-17 prototype, the Northrup F-20, the Beech Starship, and the Scaled composite ARES. 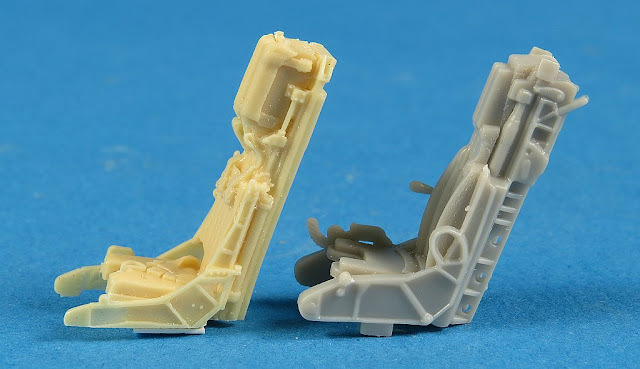 The plastic seat provided by FMK is actually very detailed. 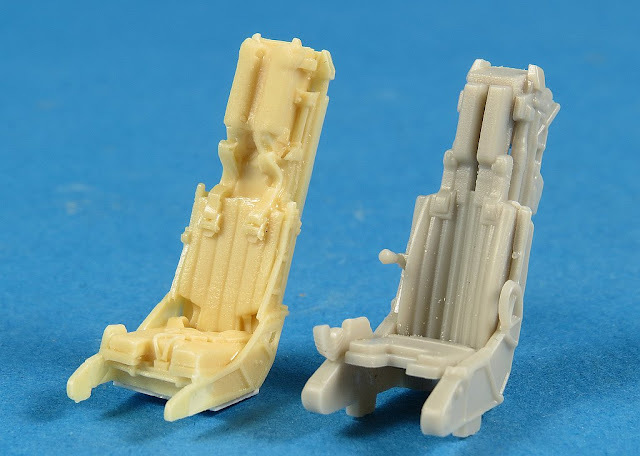 I compared it to a resin seat from Black Box and I think it stands up pretty well. 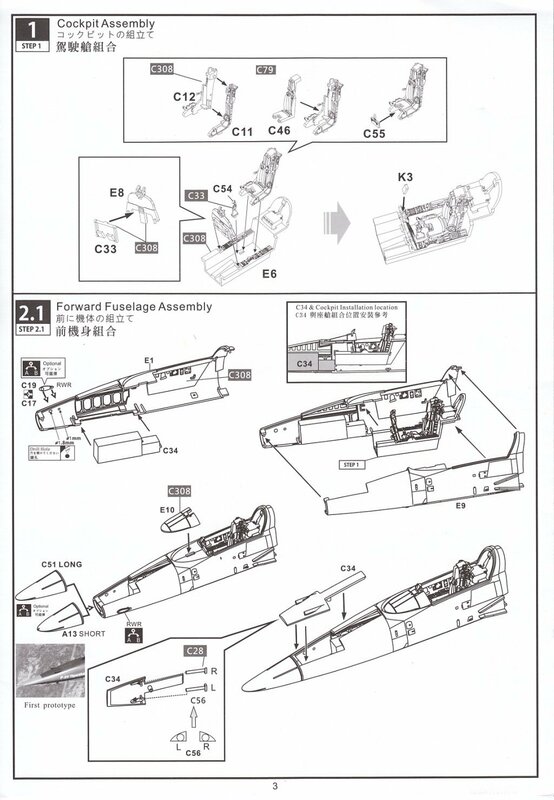 As I’ve mentioned before if you plan to build the first prototype A/C then you would need to replace this seat (as well as the whole cockpit and canopy) with a set from an F-5E kit. 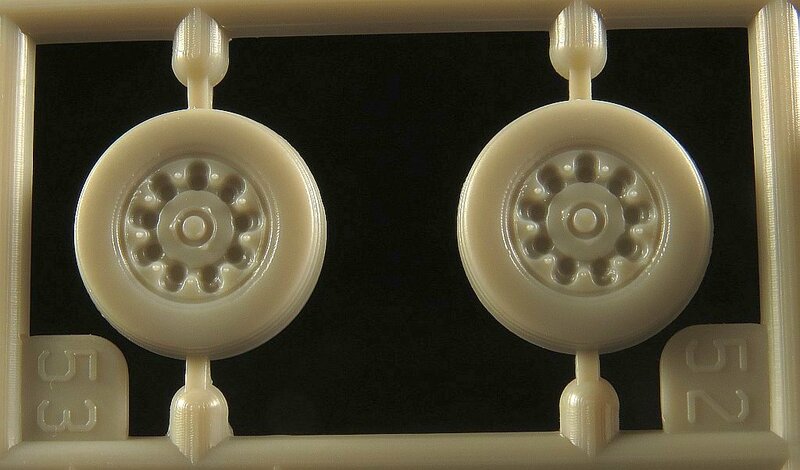 The kits main wheels are pretty traditional in that they are moulded in two halves with a join down the canter line. 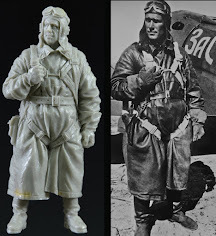 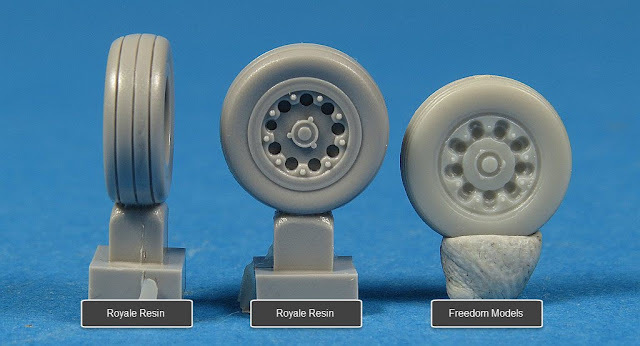 Royale Resin is an after-market manufacturer who specializes replacement resin wheels for aircraft models. Doug has sent me a sample of his new wheels for the F-20 kit and as you can see they are a definite step-up when compared to the plastic parts. The Royale Resin wheels are a straight drop in for the kit wheels. 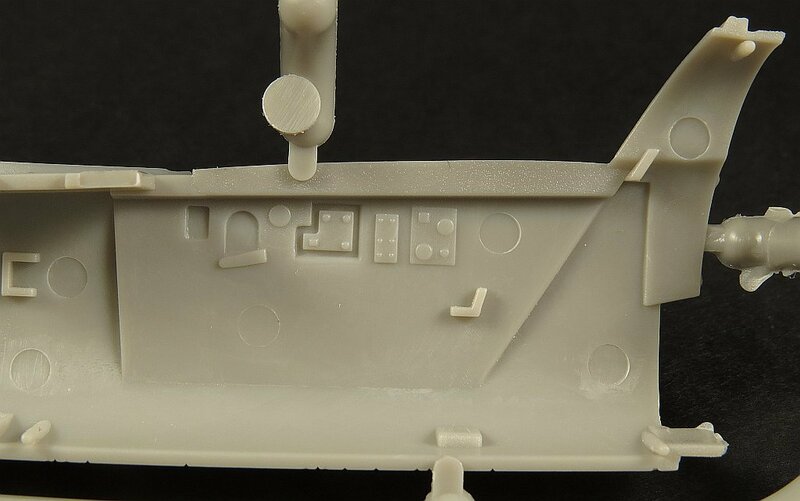 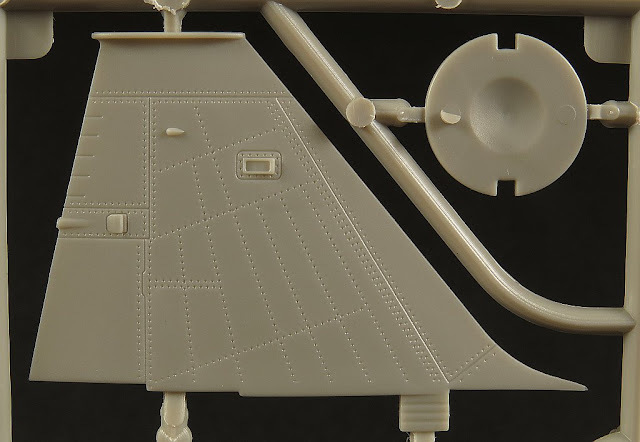 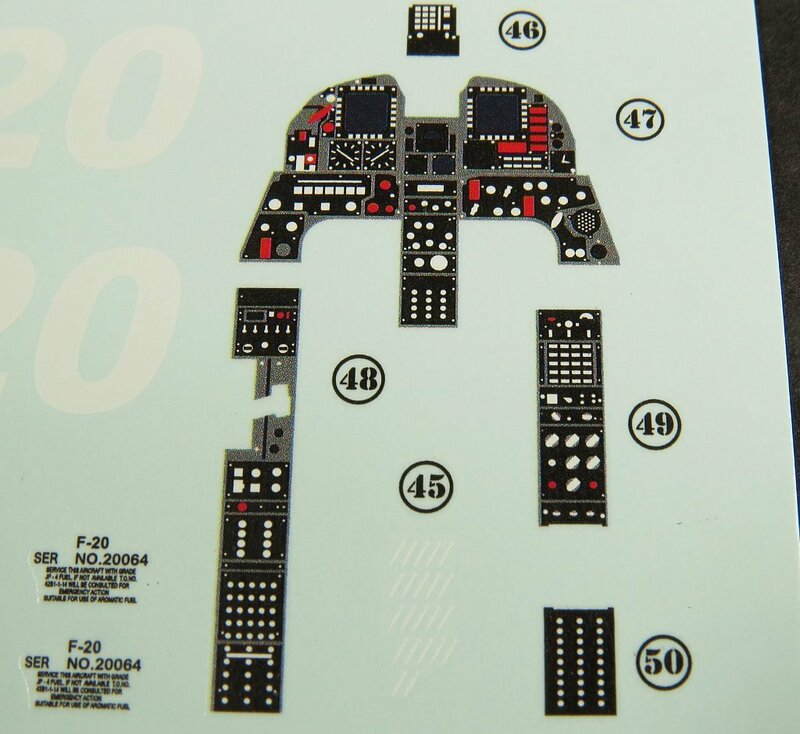 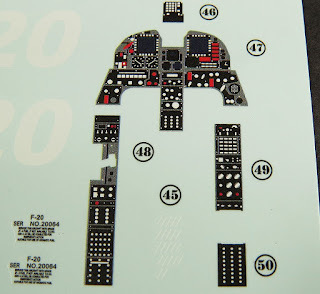 This sprue is relatively small and contains the forward fuselage halves, cockpit tub, instrument panel and shroud. 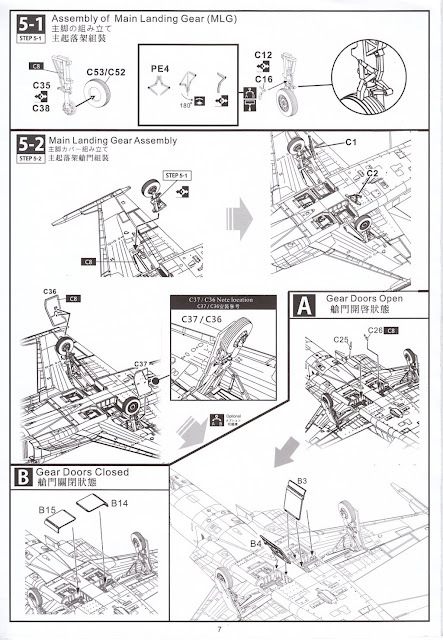 Two canopy hinge mechanisms are provided, one for open and the other for closed. 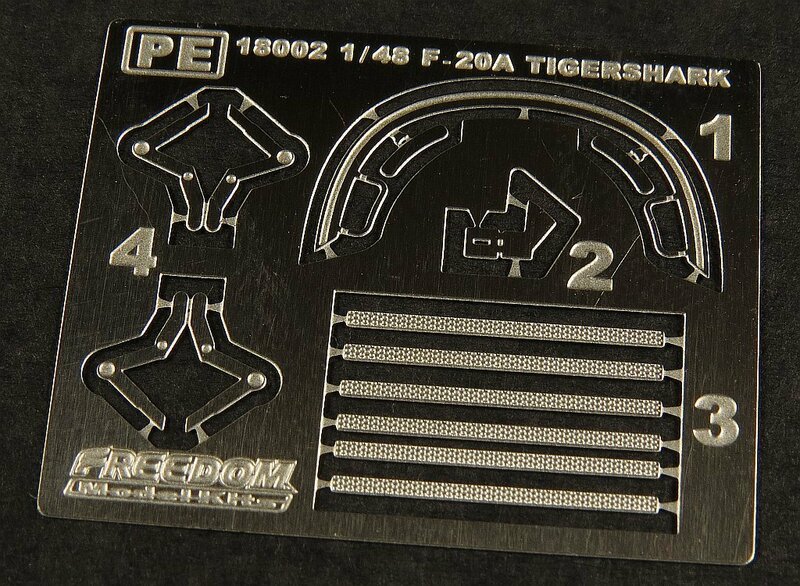 Even though (in my opinion) the moulded detail on the IP is more than adequate for hand painting, Freedom have provided a full set of cockpit decals which you can use. If I were to use the decals I’d probably cut out each “panel” and place it separately as the background grey colour has not come out too convincingly on the decal. Freedom have incorporated a useful idea into the design of this kit. 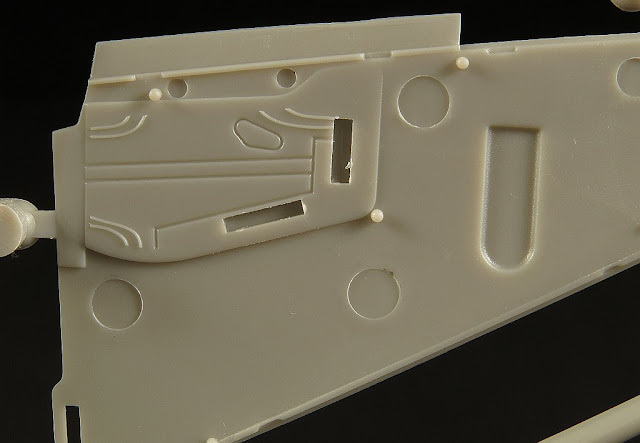 In the nose they have provided interior panel detail for the gunbay access doors. 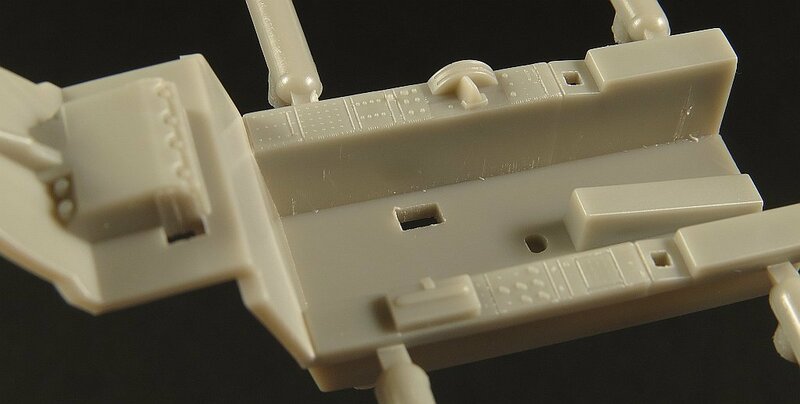 Why would they do this you may ask, well it’s for those modellers who want to open the gunbay and not have to scratch build their open replacement doors. Now Freedom don’t give you any parts (guns in this example) to put inside, that’s up to the modeller themselves but to make the job of removing the doors easier, Freedom have pre-thinned the plastic along the edges of the panel lines. 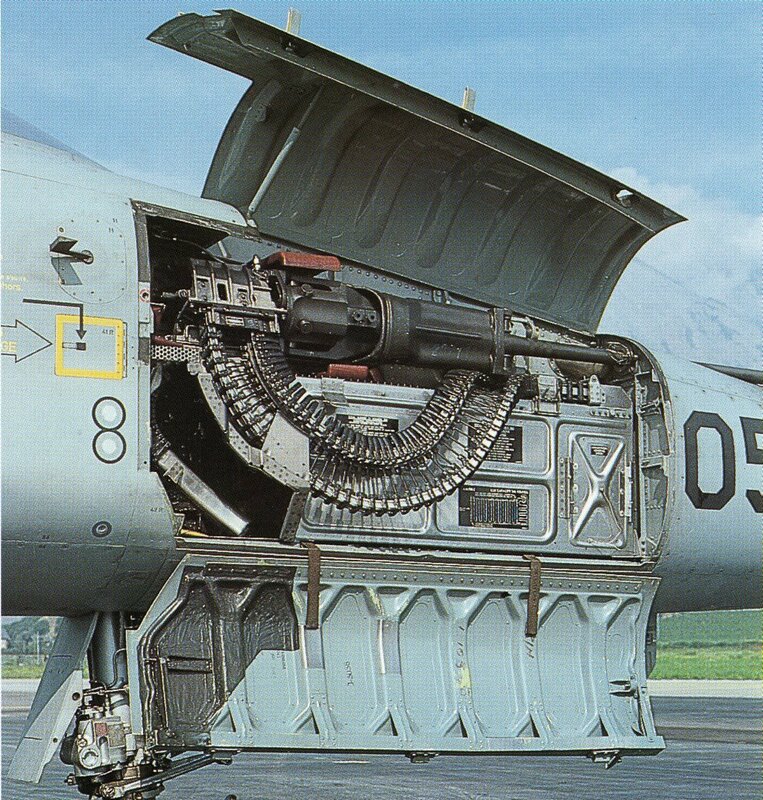 I have not tried it but I suspect all you would need to do is run a sharp blade along the panel edges a couple of times and they would just pop out. I think this is a great idea and sure beats the alternative of supplying the doors separately and having modellers struggle to get them closed neatly in the event they don’t want them open (which would be the majority of people I think). 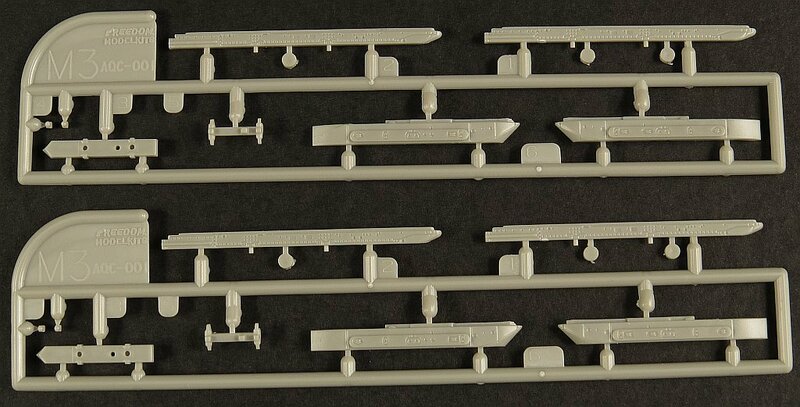 The remaining plastic sprues, M1 thru 4, are dedicated to stores and weapons. 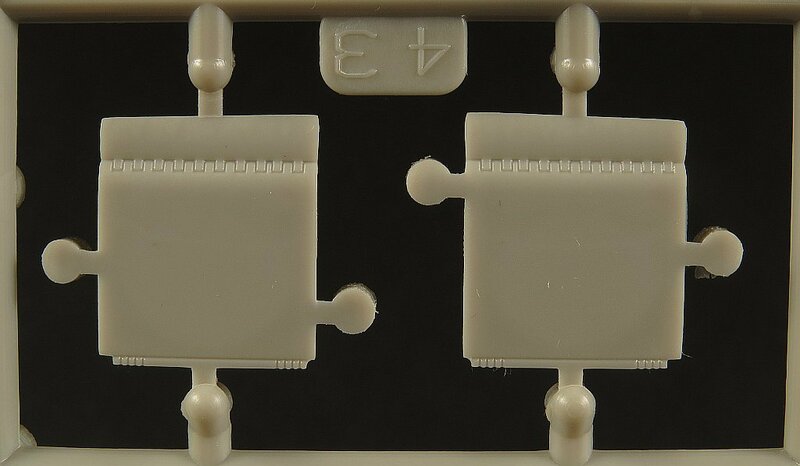 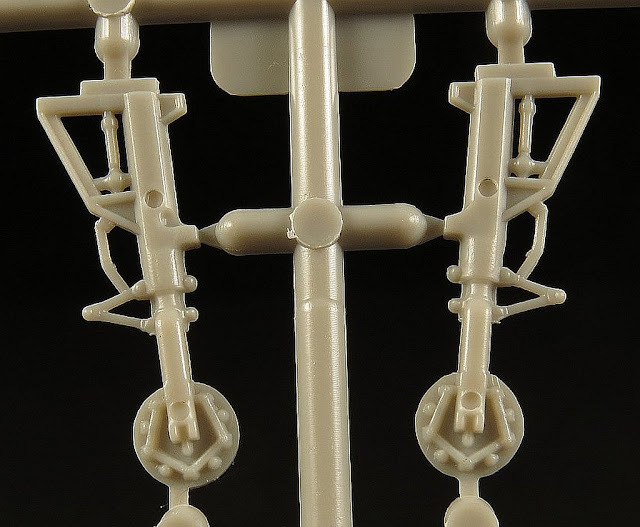 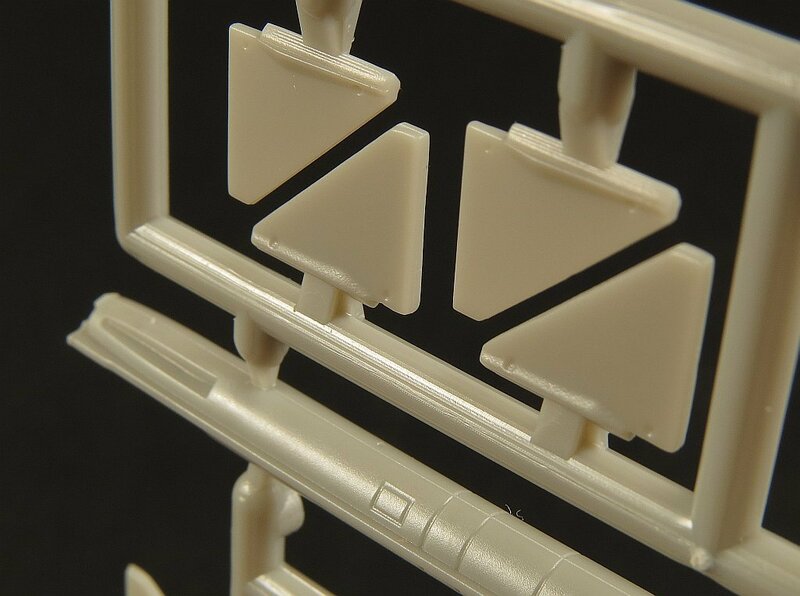 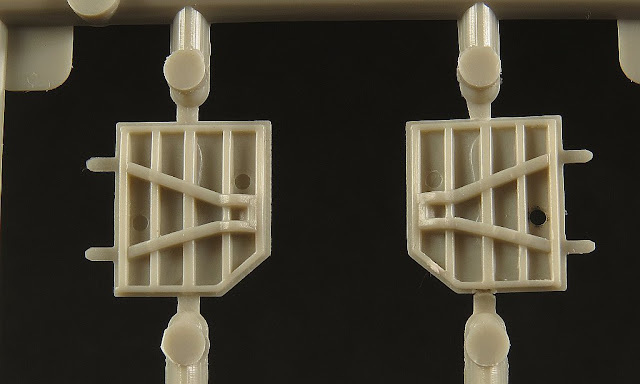 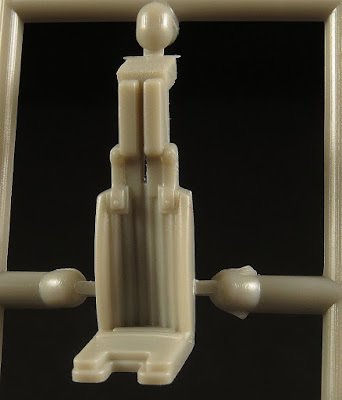 Sprue M1 contains the wing pylons with sway braces. 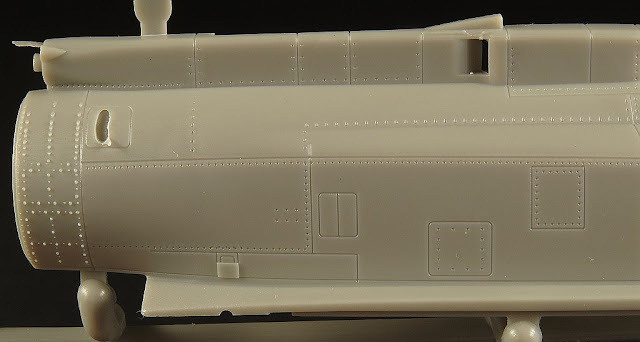 Two 150 gallon drop tanks are also provided. The raised ribbing and the fins on the tanks look a bit pronounced to me when compared to photos of the real aircraft. 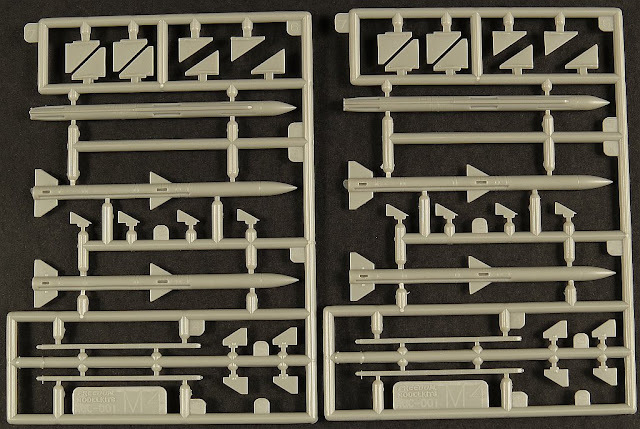 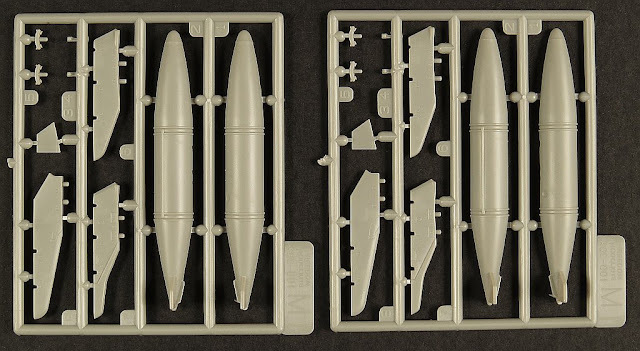 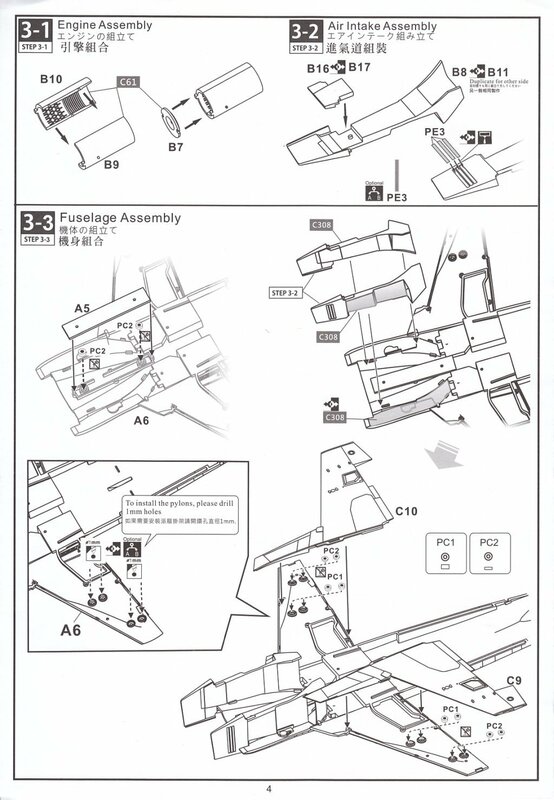 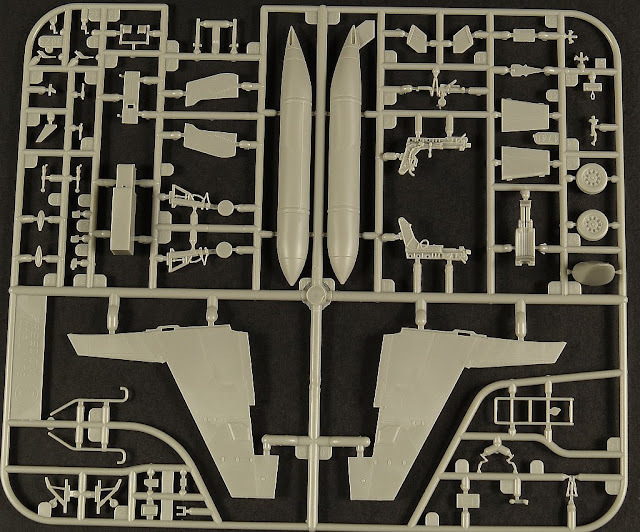 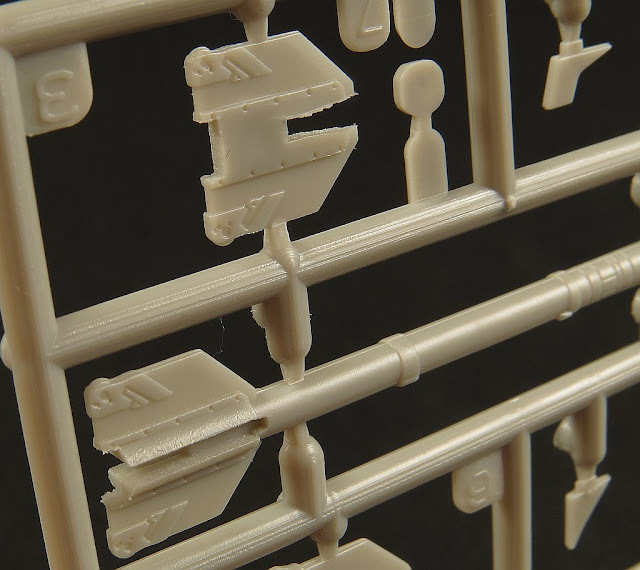 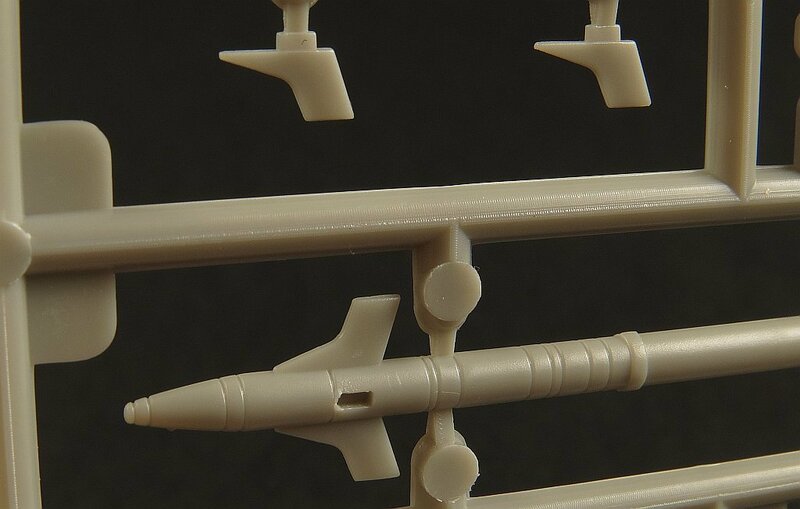 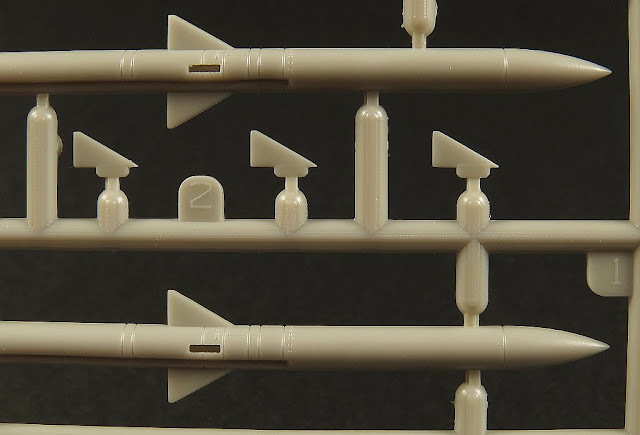 This second weapons sprue contains parts to make 4 x AIM-9 Sidewinder missiles. The Freedom instructions indicate that you can make up a 9L from part M2-1 but I believe this to be a mistake. 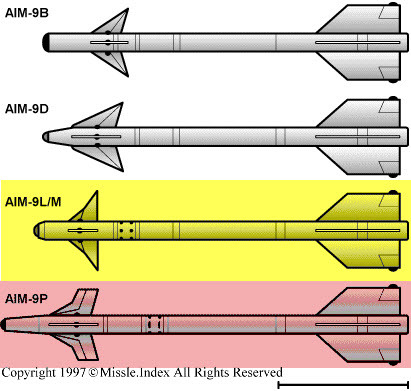 The shape of the forward fins on part M2-1 looks more like those found on the AIM-9N/P, whilst the fins on part M2-4 look correct for an AIM-9L/M. 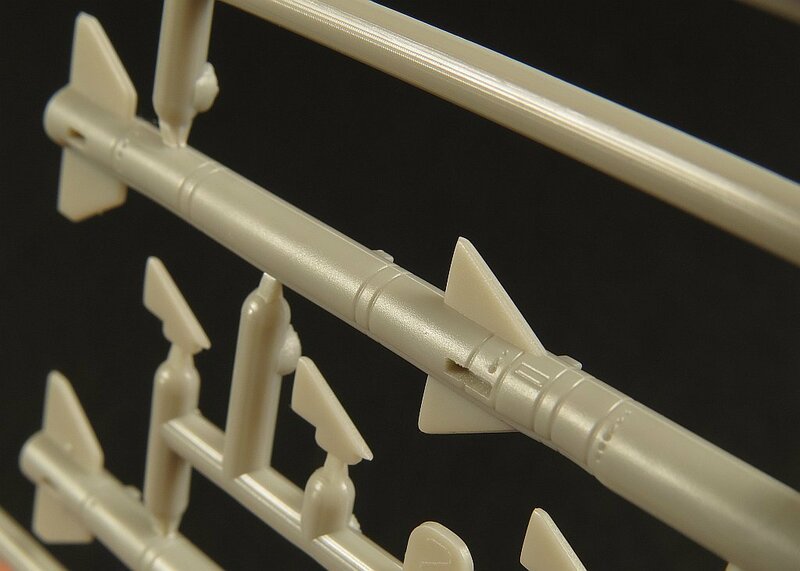 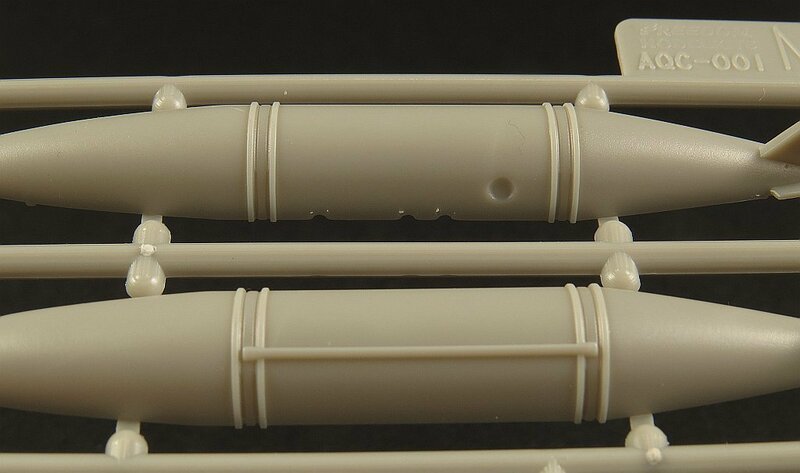 This sprue contains the parts for assorted launch rails for use with the air-air missiles provided. 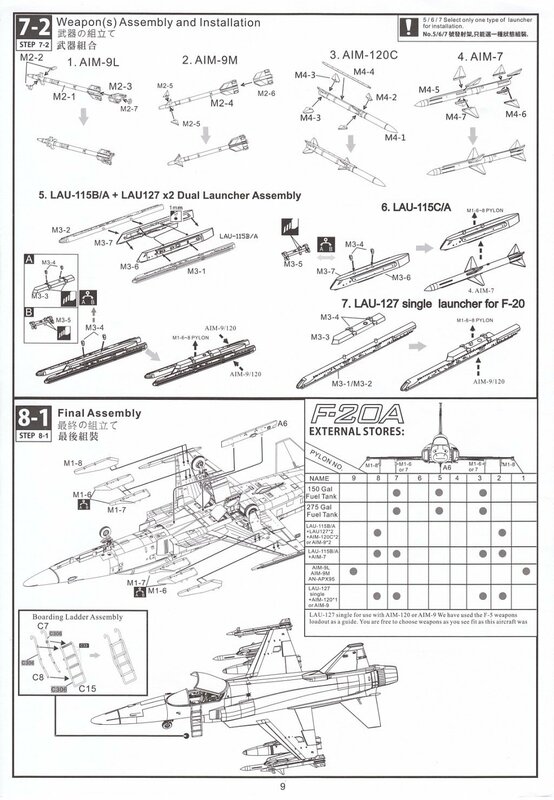 A combination of LAU-115B/A and LAU-127. LAU-115/A and LAU-115A/A are rail launchers designed for carriage and launch of AIM-7 missiles from F/A-18 aircraft. This final weapons sprue contains parts to make 4 x AIM-120 AMRAAM missiles. 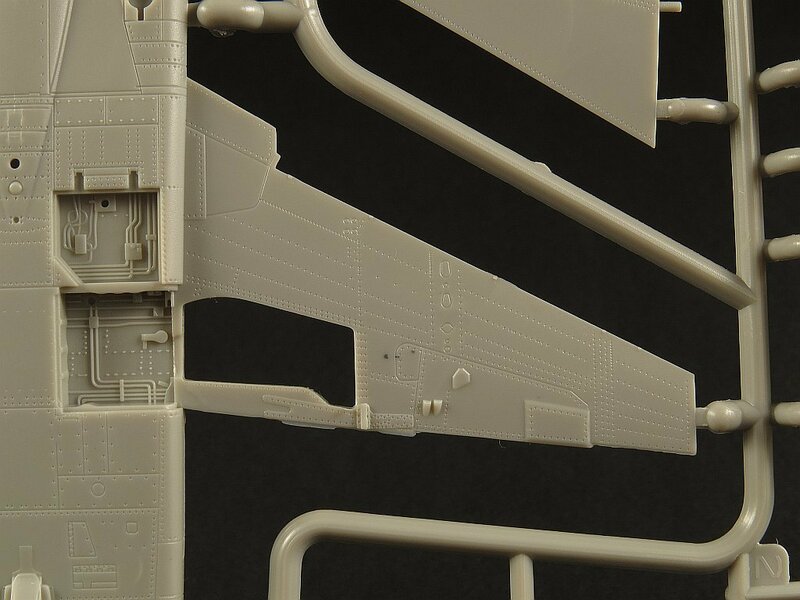 A small PE fret is provided that contains detailing for the canopy frame (grab handles and mirrors), intake splitter plate and main undercarriage supports. 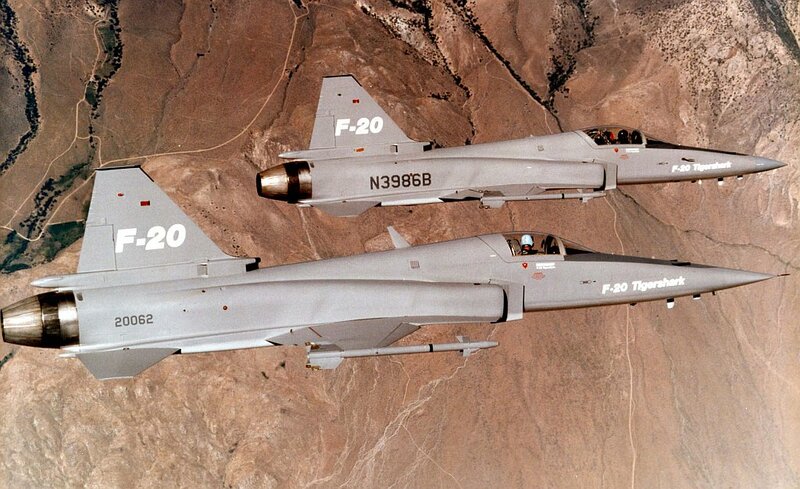 Only three airframes were ever built of the F-20A. 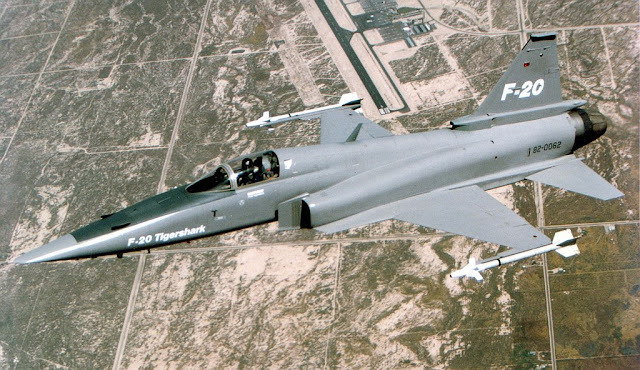 During the various stages of the FX program they were painted in different schemes and Freedom have provided decals for all three schemes worn by the demonstrator jets. 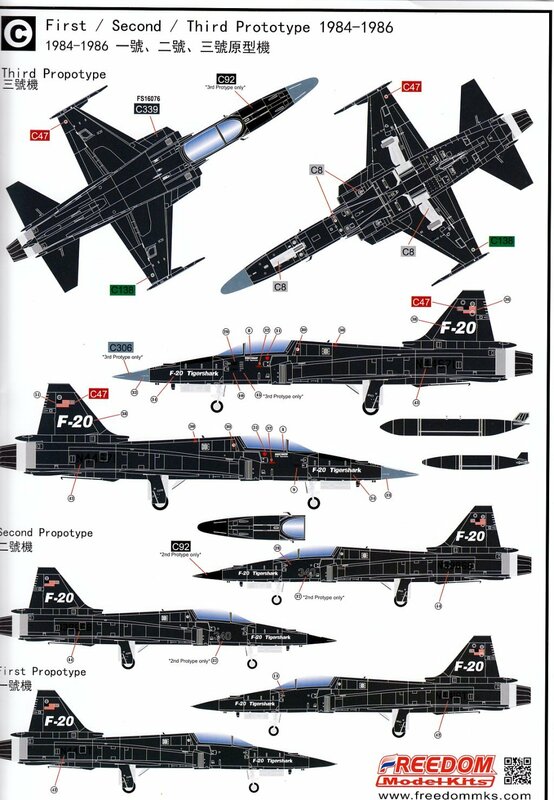 •82-0062 (Northrop serial number GG.1001) - crashed at Suwon Air Base, South Korea on October 10, 1984. 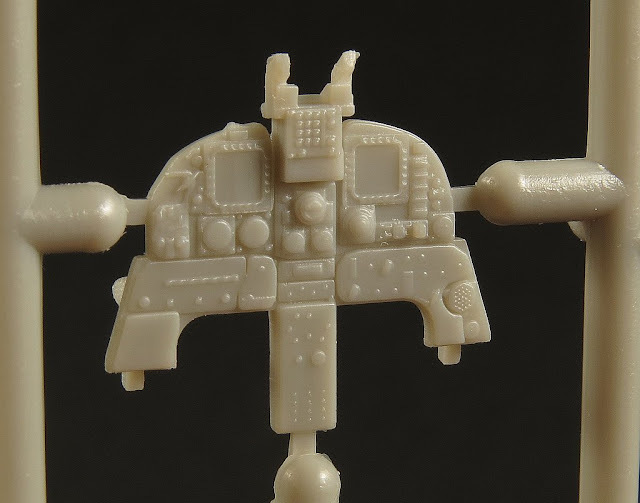 Pilot killed. The first (and by far most colourful) was only worn by the first prototype for the Paris airshow in 1983. As I’ve mentioned above you can’t really build this particular aircraft out of the box because the cockpit and canopy were from an F-5E and Freedom do not provide those parts in the kit. 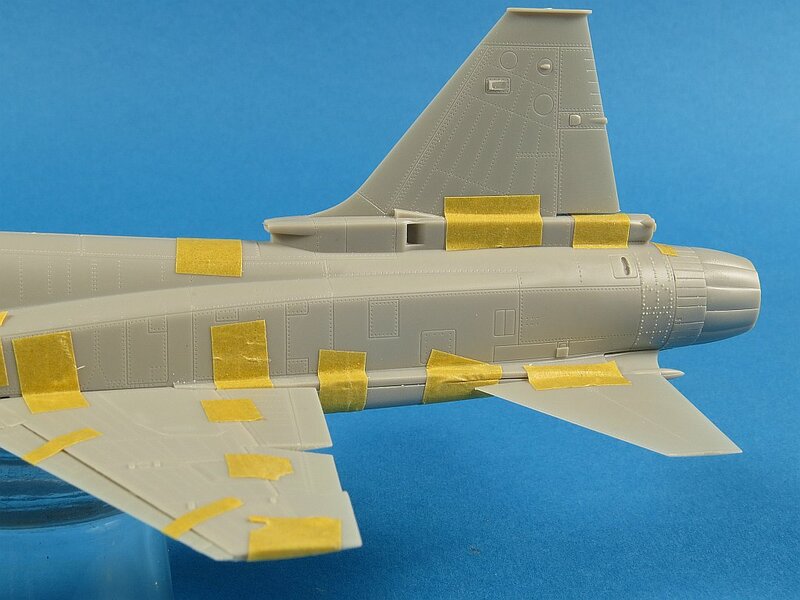 If you had a spare F-5E kit I think it would be a fairly easy job to steal the IP, seat and canopy and fit them to the FMK fuselage. 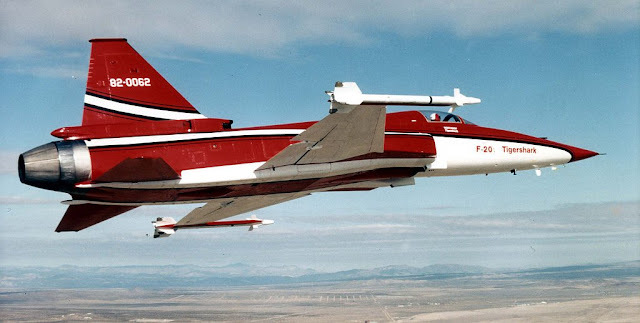 •82-0063 (Northrop serial number GI.1001) - crashed at CFB Goose Bay, Canada on May 14, 1985. 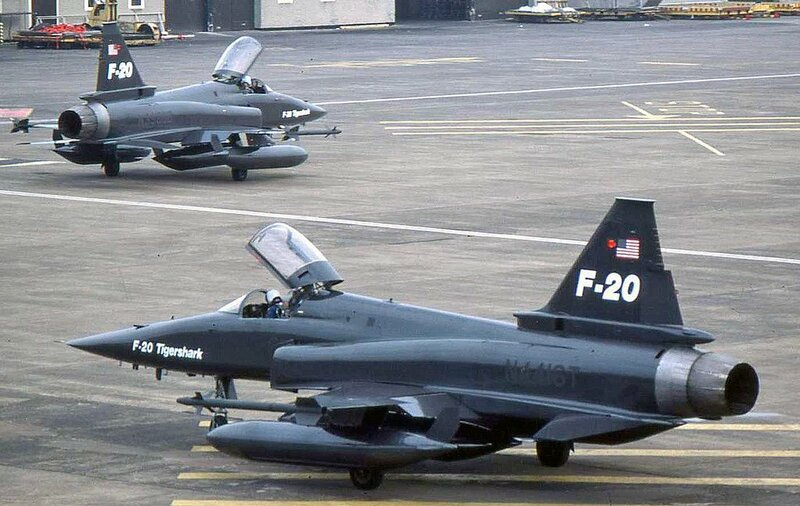 Pilot killed. With the arrival of the second prototype both airframes were painted in a more subdued grey scheme. 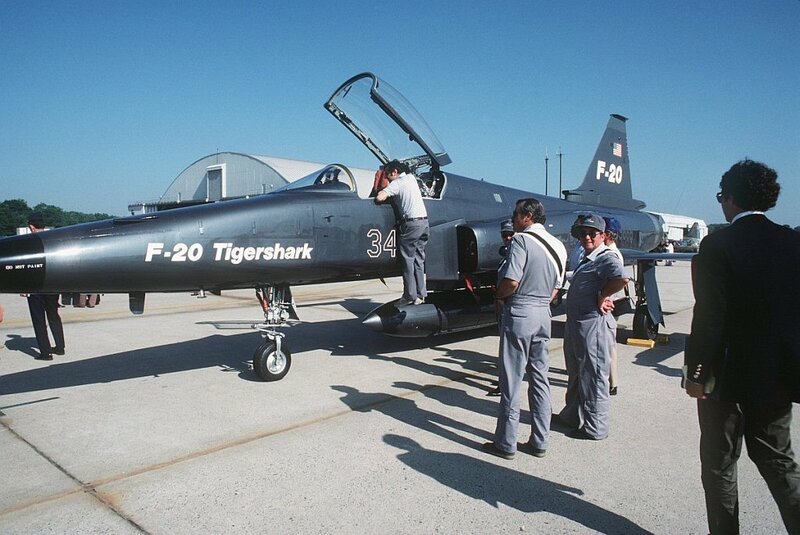 •82-0064 (Northrop serial number GI.1002) - California Science Centre in Exposition Park, Los Angeles, California. 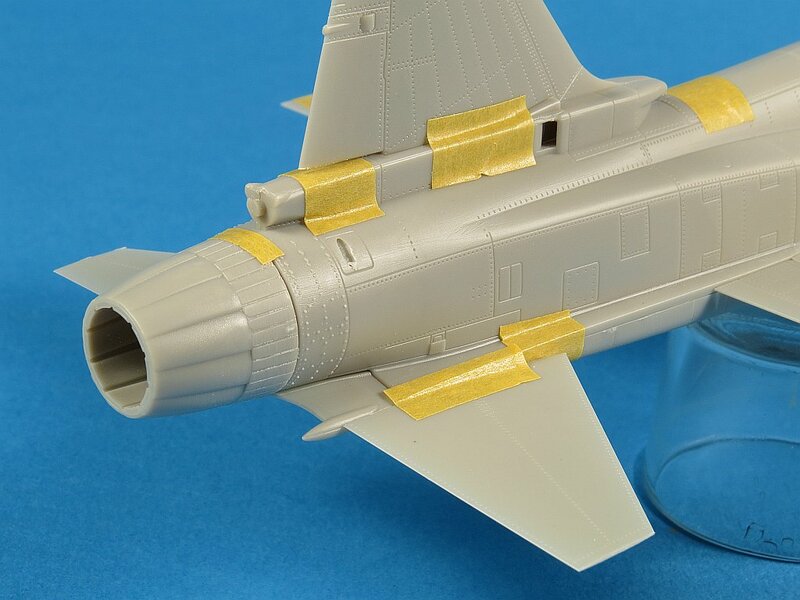 The final paint scheme that was applied to the F-20’s was a dark grey metal-flake colour. I have seen mention that this was actually a BMW automotive paint which Northrop used as they felt it the BMW colour implied “quality”. 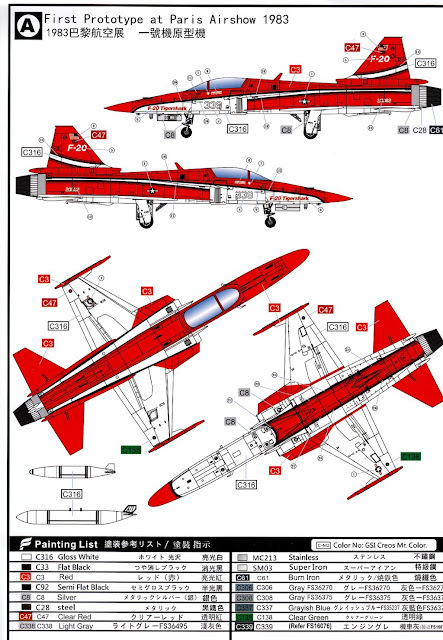 Freedom provide markings to reproduce any of the prototype schemes for each aircraft. 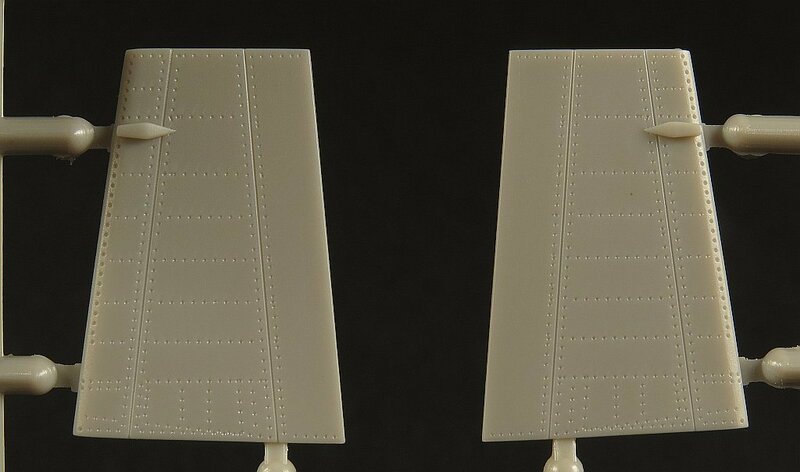 It’s worth noting that the decals are very thin which is a notable improvement from the X-47 kit which had very thick decals. It’s good to see a kit manufacturer listening to the feedback from modellers. 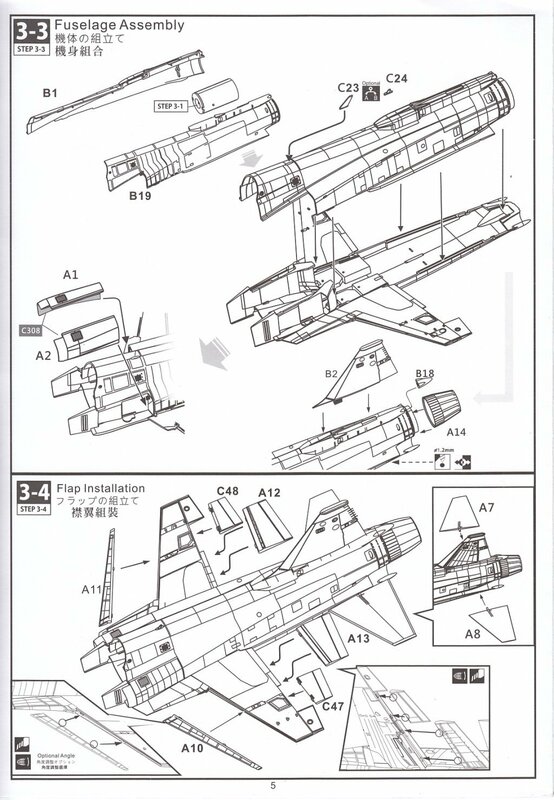 If you don’t want to build one of the prototype schemes then perhaps a what-if scheme may appeal. Northrop was courting many potential export customers as part of the FX program and Freedom has given us a head start with the second, smaller sheet of generic national insignia markings. 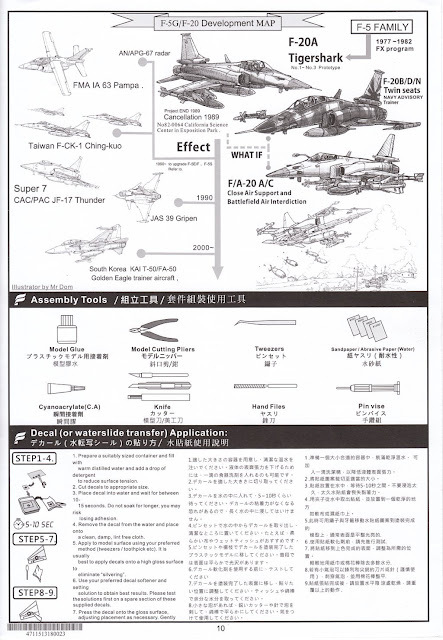 Freedom Model Kits continue to impress me with their releases. 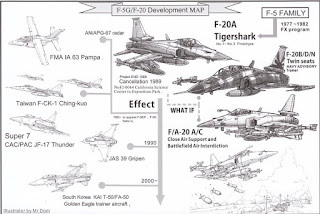 I like that they are going off the beaten track and give us subjects out of left field. 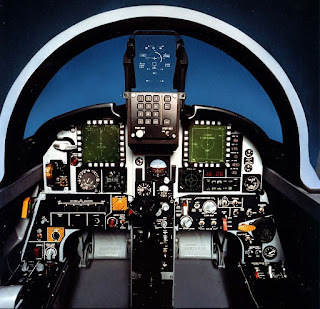 They have certainly taken on board the feedback from their customers around their first kit (the X-47) and that’s a great sign because if you ignore your customers then they will start to ignore you. 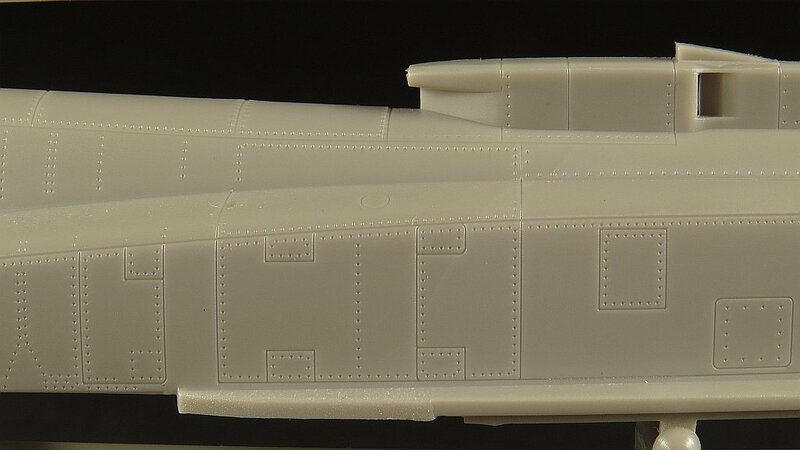 Freedom have already announced the next kit based on this mould, the two seat F-20B/N, which is purely a what-if as no prototypes were ever built. 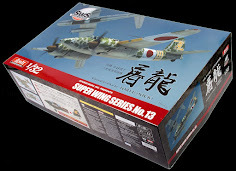 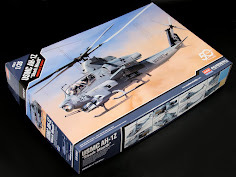 Many thanks to Freedom Model Kits for the review kit. 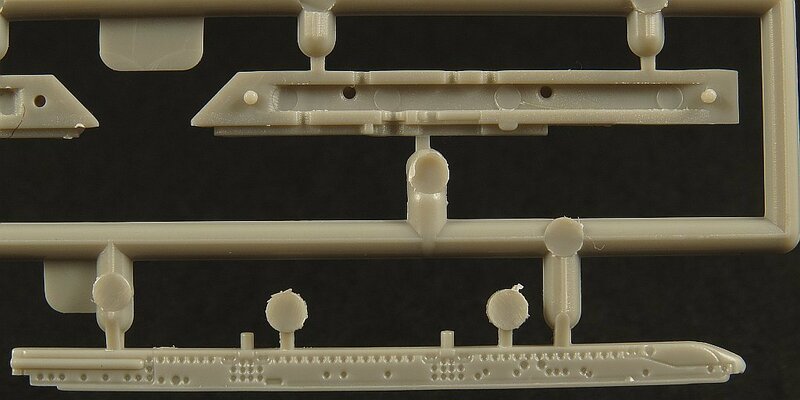 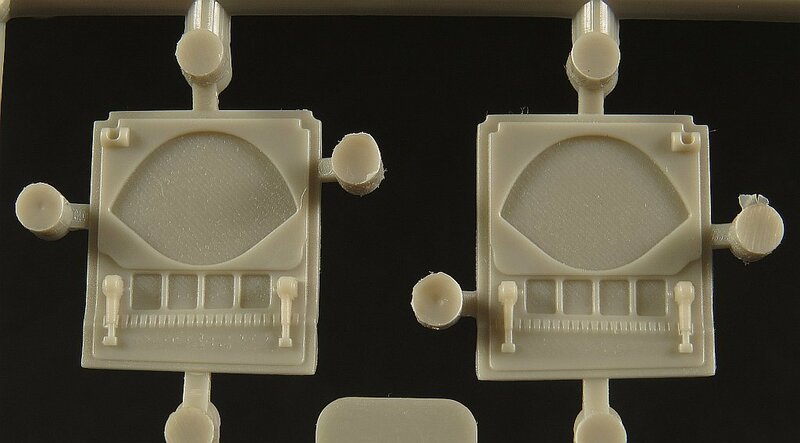 Those with sharp eyes will have noticed that Sprue D is missing. 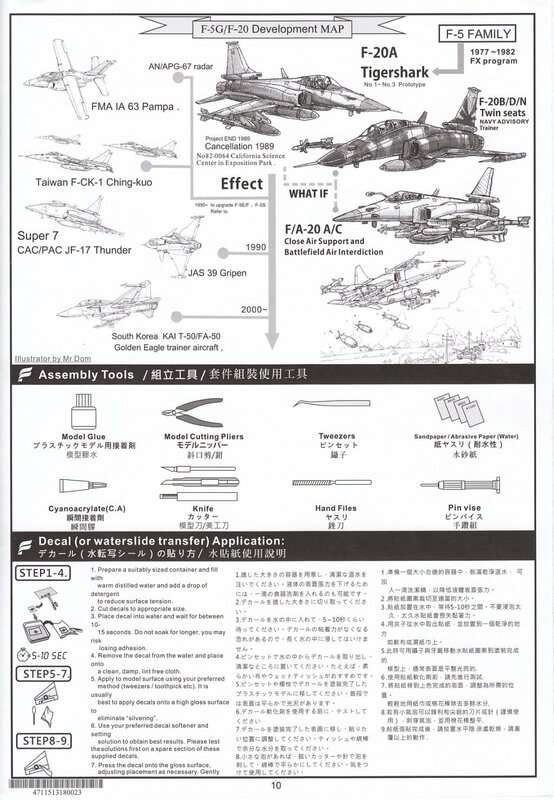 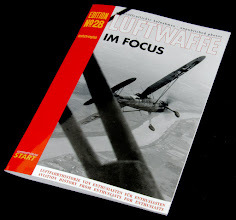 I suspect it will make an appearance in the upcoming two seat F-20B/N kit that Freedom has just announced.